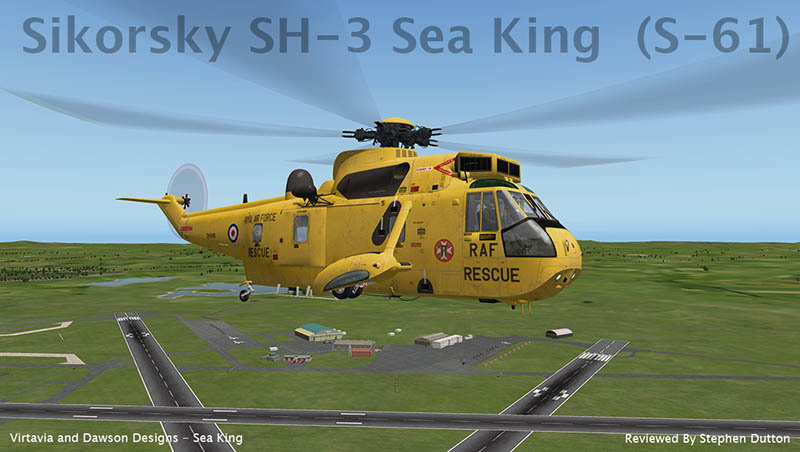 In the 1960's or 70's the Sikorsky SH-3 Sea King was everywhere. You couldn't miss it. If it wasn't fighting in Vietnam it was pulling someone off the side of a mountain or out of the sea. Or more famously it plucked the returning moon astronauts out of the South Pacific or the aircraft flew the current American President around the country as "Marine One". In tactical roles it flew from ships to search out Cold War foes and was unbeatable in Anti-Submarine warfare (ASW). It was a major asset in the Falklands War, The first Gulf War and the Balkan war - and one Sea King had also the option of being outfitted to deploy the B57 nuclear bomb! 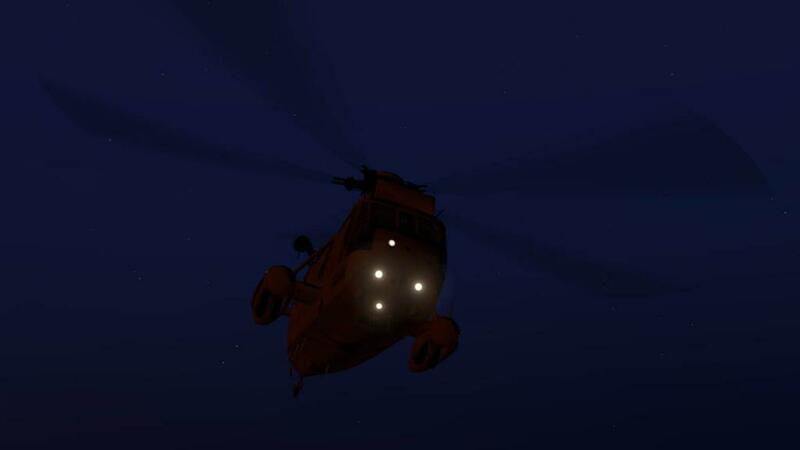 It's main roles were more mundane however, ship to ship supply, SAR (Search and Rescue) and Coast Guard duties. But one thing was sure, It was a significant contribution to aviation. Ask anyone to name a helicopter, any helicopter and the answer will usually be either... "The Huey" or "The Sea King"
The Sea King was a considerable advancement over previous helicopters because of its twin-turboshaft powerplant layout, which gave the gave the SH-3 a heavier payload capacity and a high level of reliability far in excess of previous anti-submarine helicopters. The S-61 is a Cold War creation as the Soviet Navy had elected to construct a large fleet of over 200 submarines, the US Navy then chose to counter this threat by investing in newer and increasingly capable ASW technologies and platforms. 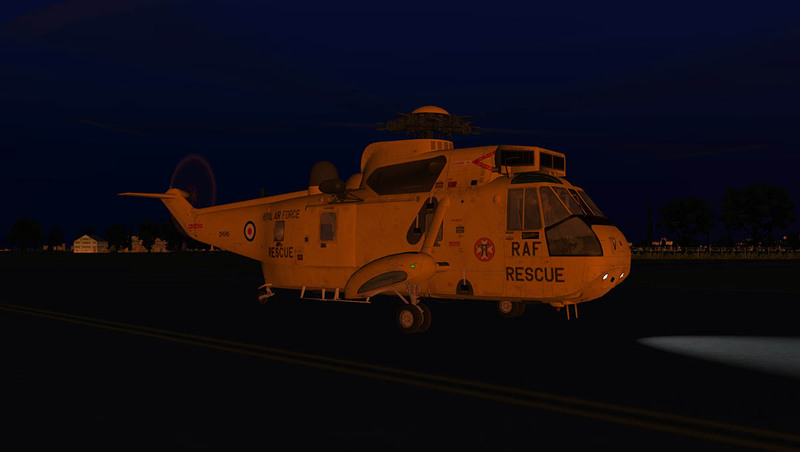 Sea Kings operating in the anti-submarine capacity typically had a four man crew; a pilot and copilot in the cockpit and two aircrew in the cabin area to operate and monitor the aircraft's detection equipment and to interpret the sensor data; the two rear aircrew were retained in other mission roles such as cargo transfer and rescue operations. The cabin can accommodate up to 22 survivors or nine stretchers in addition to two medical officers in a SAR capacity; up to 28 soldiers can be accommodated when operated as a troop transport. The The first prototype took flight for the first time in March 1959, and carrier suitability trials were conducted on board the USS Lake Champlain; the trials were completed successfully in mid-1961. 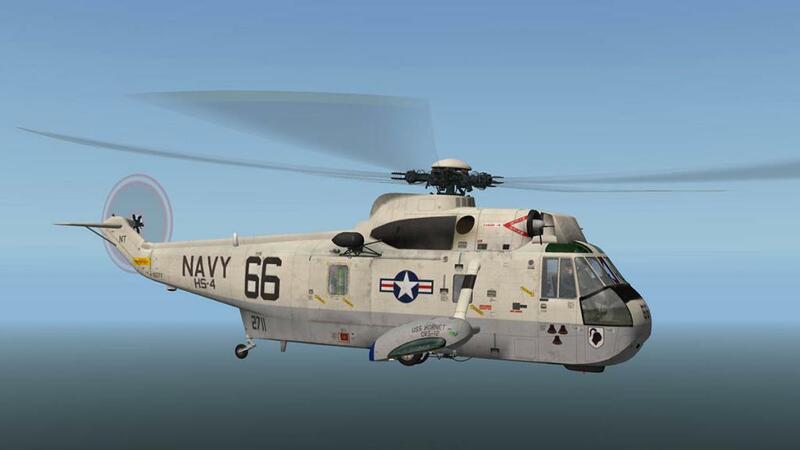 Production deliveries of the HSS-2 (later designated SH-3A) to the US Navy began in September 1961, these initial production aircraft were each powered by a pair of General Electric T58 turboshaft engines. In late 1961 and early 1962, a modified U.S. Navy HSS-2 Sea King was used to break the FAI 3 km, 100 km, 500 km and 1000 km helicopter speed records. This series of flights culminated on 5 February 1962 with the HSS-2 setting an absolute helicopter speed record of 210.6 mph. This record was broken by a modified Sud Super Frelon helicopter on 23 July 1963 with a speed of 217.7 mph. Sikorsky also developed a variant of the Sea King for the civil market, designated Sikorsky S-61L. The first operator of the S-61L was Los Angeles Airways, who then introduced them to service on 11 March 1962. Another variant with a conventional hull, the Sikorsky S-61R, was also concurrently developed for transport and search and rescue (SAR) duties, and it was this type was that was extensively operated by the U.S. Air Force and the U.S. Coast Guard. 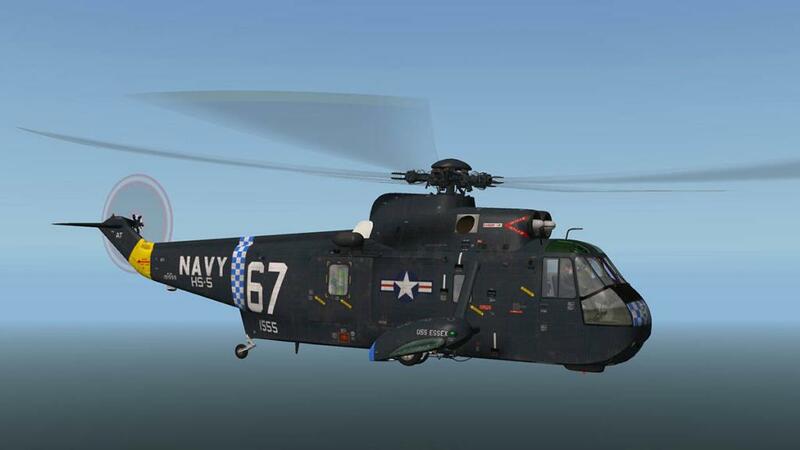 Considering the success of the S-61 program, Sikorsky stopped production of the aircraft in the 70's to focus on the Sikorsky UH-60 Black Hawk. 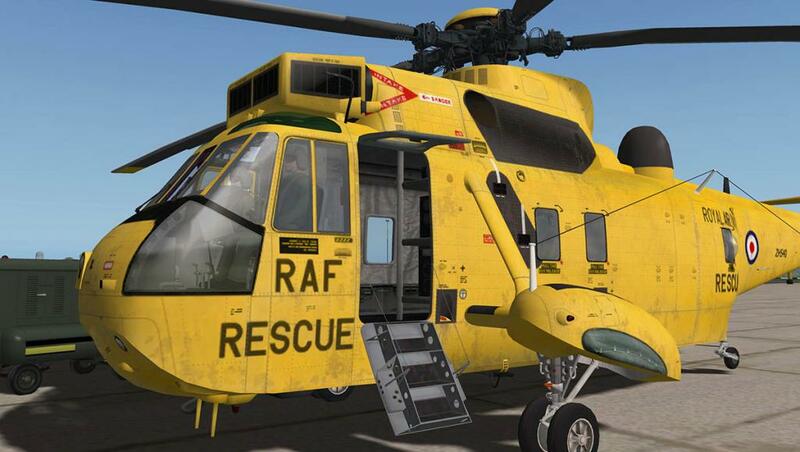 But the Sea King story didn't slip away into history there. 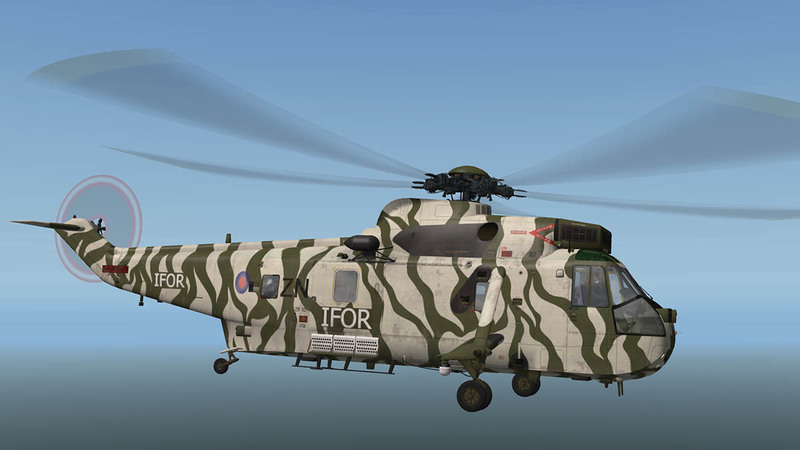 The British who saw a good aircraft when there was one, then licensed the design and redesigned the S-61 into the - Westland WS-61 Sea King. Westland by integrating a significant proportion of components from British suppliers, and with key changes include the use of a pair of Rolls-Royce Gnome turboshaft engines and the implementation of an automatic flight control system made it a formidable aircraft. And the Westland's Sea King despite outward appearances is a very different aircraft from the original Sikorsky design. 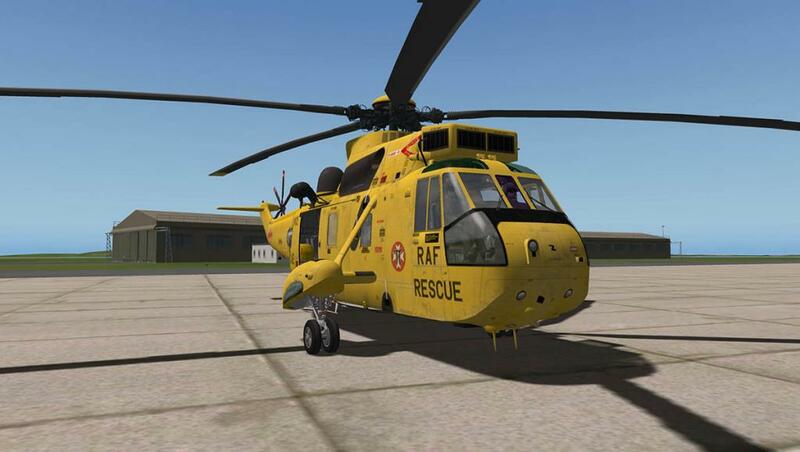 The first Westland-built helicopter, Sea King HAS1 first flew on 7 May 1969 at Yeovil. This aircraft was produced 1969–1995 and 344 aircraft were built. 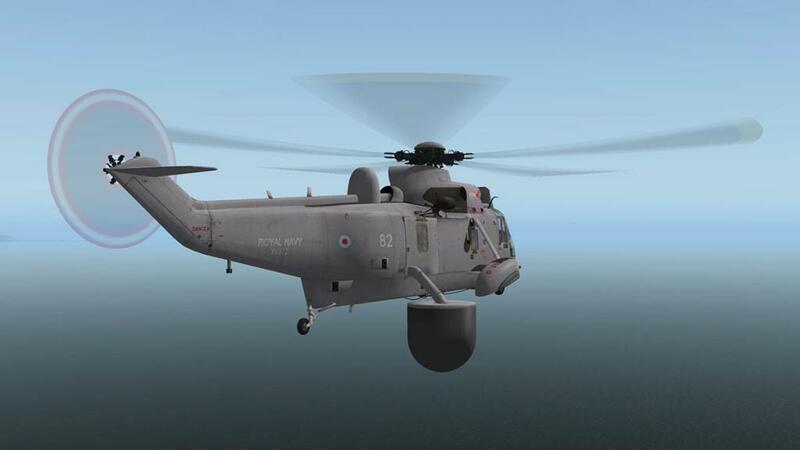 WS-61 Sea King still remains in operation in Britain, as well as multiple export customers (some under license) to: Germany, Norway, Egypt and India. 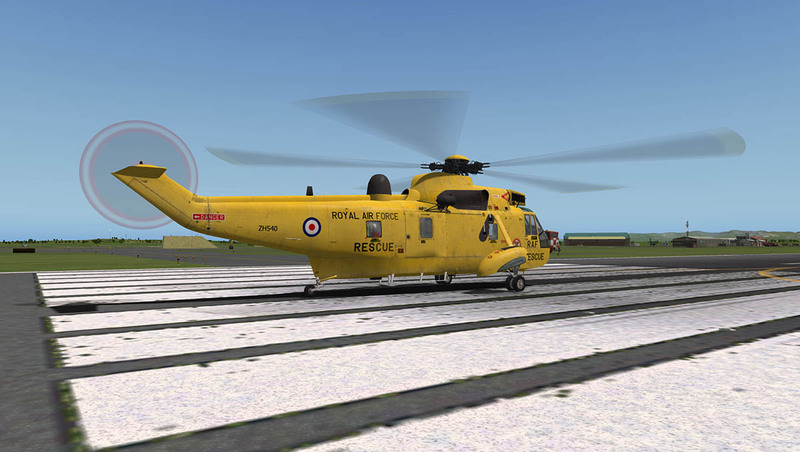 The aircraft has been highly successful in the Westland guises, it has performed in many different roles and with all branches of the British Services, notably with the Royal Navy and SAR. The Royal Navy also created a extensively modified variant called the "Westland Commando". 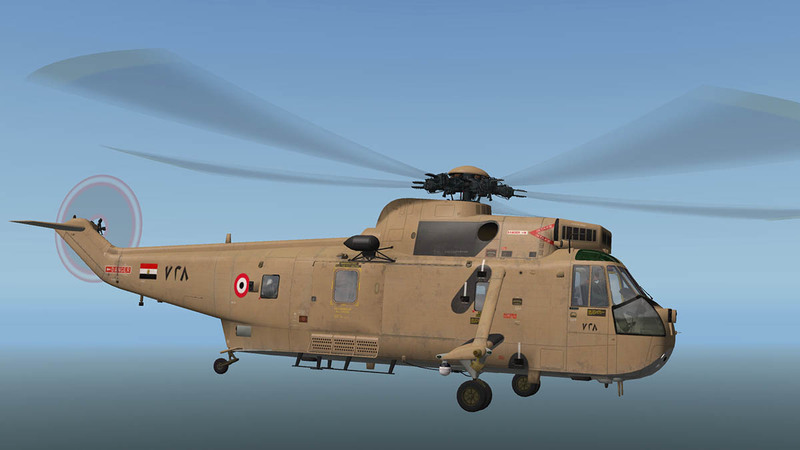 The Commando (Sea King HC4) had capacity for up to 28 fully equipped troops and had originally been developed to meet an Egyptian Air Force requirement. It first flew on 26 September 1979, and has an operational range of up to 600 nautical miles without refuelling. Highly successful In British service, the Sea King HC4 was deployed on operations in the Falklands, the Balkans, both Gulf Wars, Sierra Leone, Lebanon and Afghanistan and 330 Sea Kings were built. Exports to the Indian Naval Air Arm, the German Navy, the Royal Australian Navy, and the Royal Norwegian Air Force were also highly successful. (Specifications are for the Westland HAS 5) Maximum speed: 129 mph (112 knots, 208 km/h) (max cruise at sea level) : Range: 764 mi (664 nmi, 1,230 km) : Rate of climb: 2,020 ft/min (10.3 m/s) : Powerplant : 2 × Rolls-Royce Gnome H1400-2 turboshafts, 1,660 shp (1,238 kW) each. 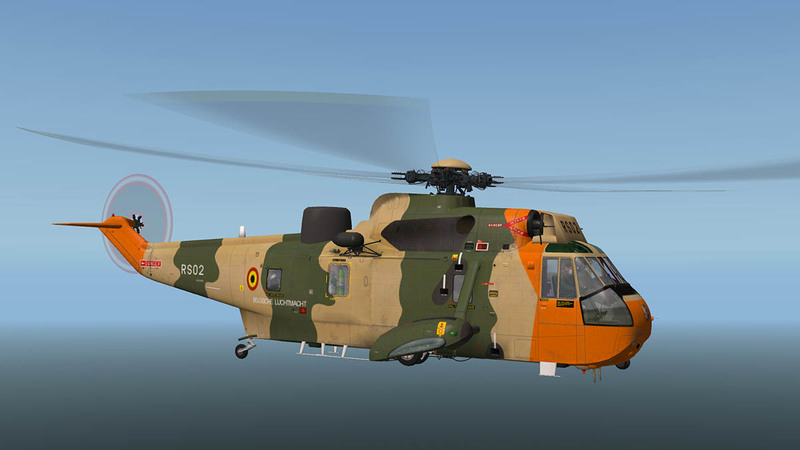 Virtavia produced the Sikorsky SH-3 Sea King (S-61) for the FSX/P3D market. 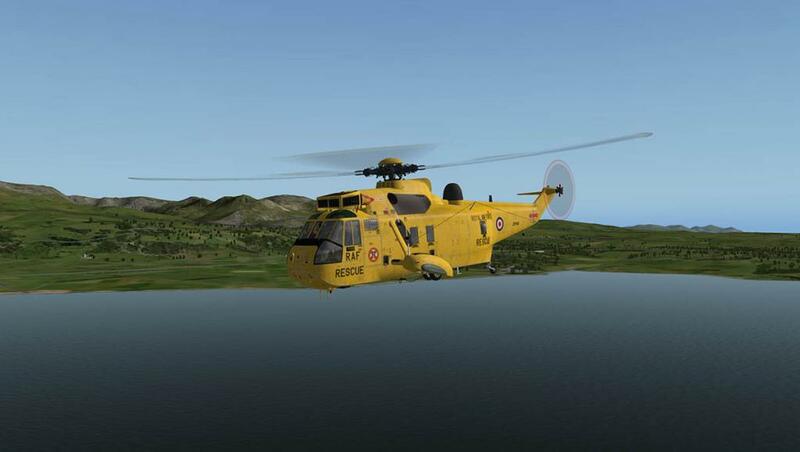 But after the successful redesign of the Globemaster C-17 from Dawson Designs, the Sea King was chosen as the next conversion. 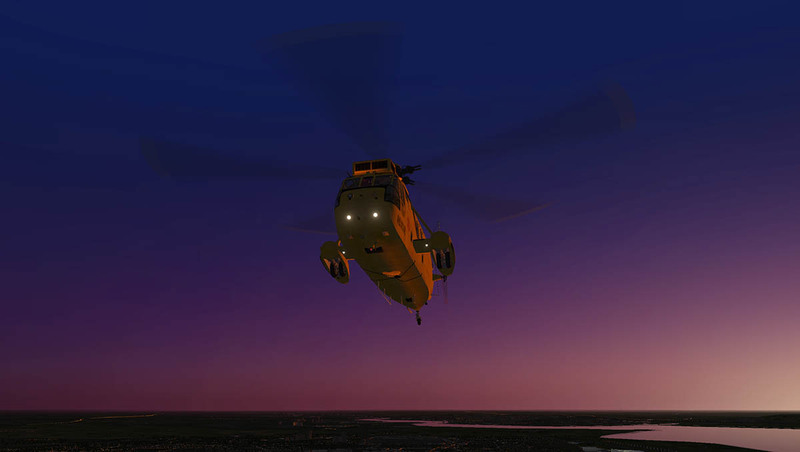 There are many improvements for X-Plane over the FSX/P3D version that includes autopilot, hover control, working winch with winchman figure and rebuilt main and tail rotor heads, Higher graded textures, X-Plane 10 HDR lighting and the DreamEngine 3d Sound and many other new features. 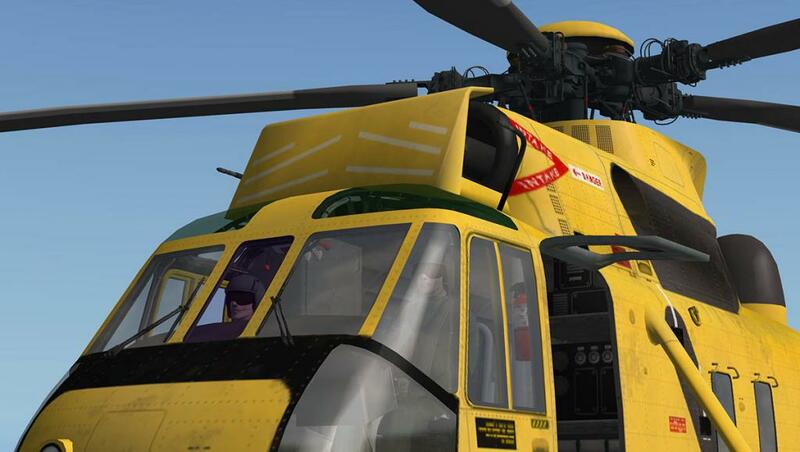 Installation is to unzip to your upload file (326.80mb) to your Aircraft/Helicopter folder (full size file 620.70mb). To note there are two different Aircraft versions in the Standard SH-3 and the Commando version. You can also map your joystick buttons for use in the "Hover" mode AFCC and activation (recommended). Included is a manual (24 Pages) and full checklist (3 Pages). The Sea King is an iconic design, There are nine variations included in this series, the default version is the Royal Airforce HAR Mk3 in "Rescue Yellow". 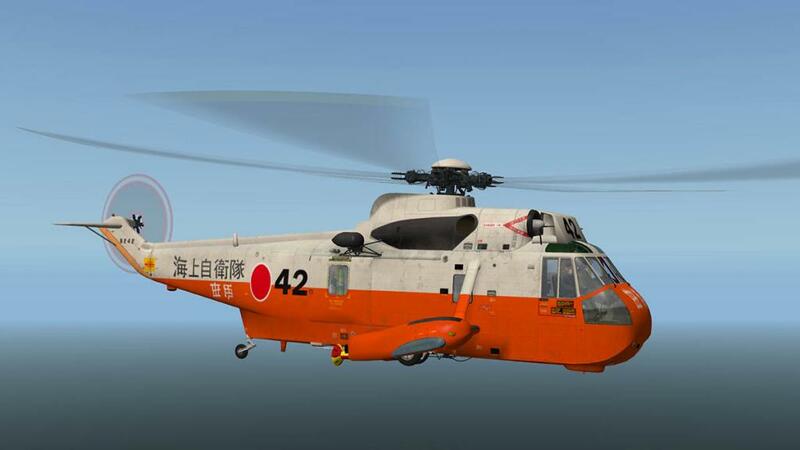 It is a five bladed design (Tail rotor is also five bladed) that was later upgraded to the "Carson" composite blades. 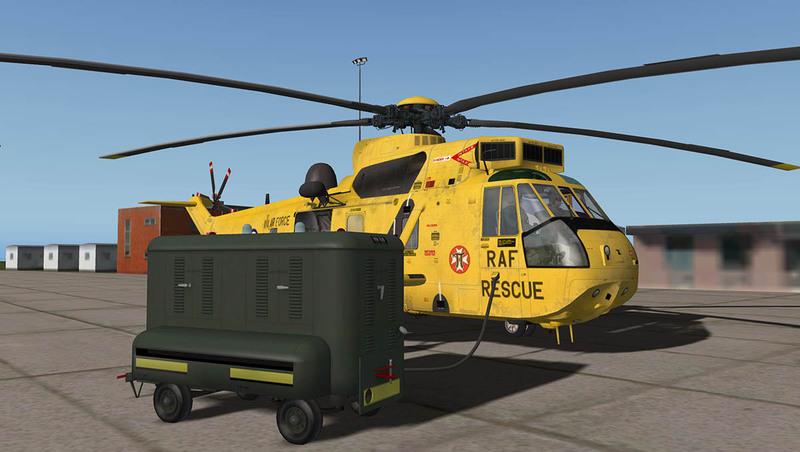 First to note is the External Power (GPU) unit that is typical of what the RAF use. 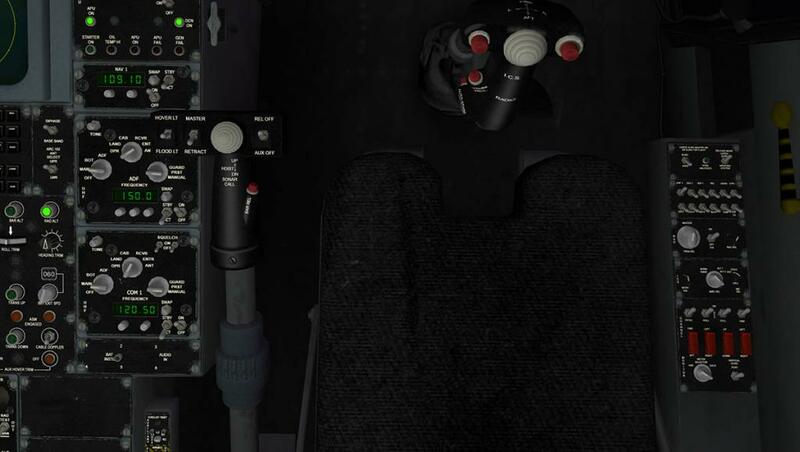 A switch on the OHP (Over Head Panel) or the menu selection will deploy the unit connected to the aircraft. Externally the Virtavia design work is excellent. 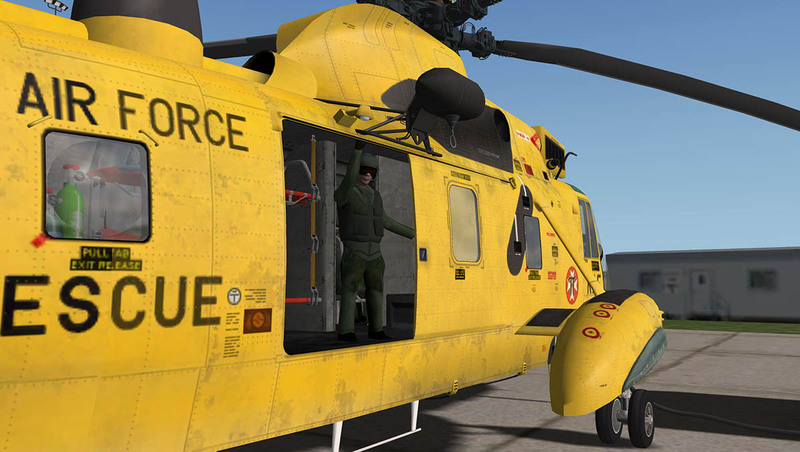 With excellent textures (updated by DD) and excellent features of the winch (and belly hook) radar domes and other major external fittings. One highlight is the bubble windows that protrude from the rear aircraft fuselage that are excellent in their design and glass reflection, notable also is all the excellent cockpit glass with the green overhead panels. Many of the variants also have different equipment attached from Flir cameras to flares and low flying-aids. 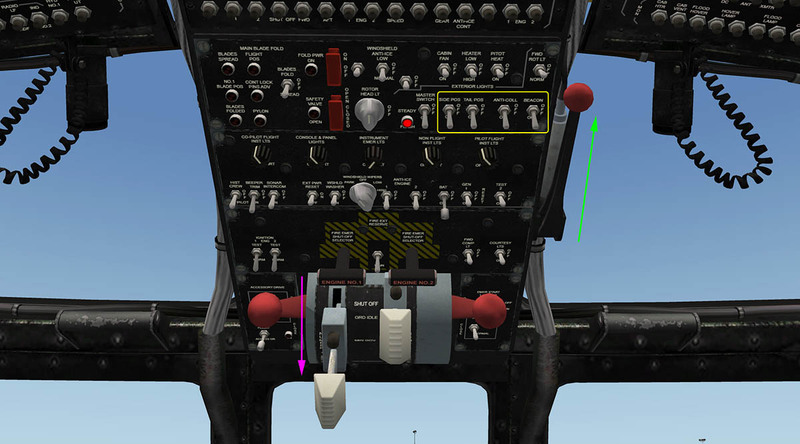 The main fuselage door opens via the menu (or key shift-F2) to reveal the winchman. 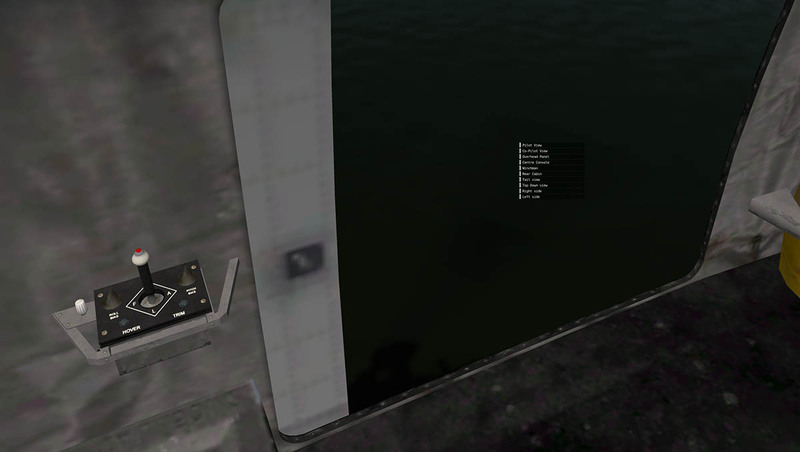 Split left side is the crew hatch (door) that is also key switchable (shift-F1). 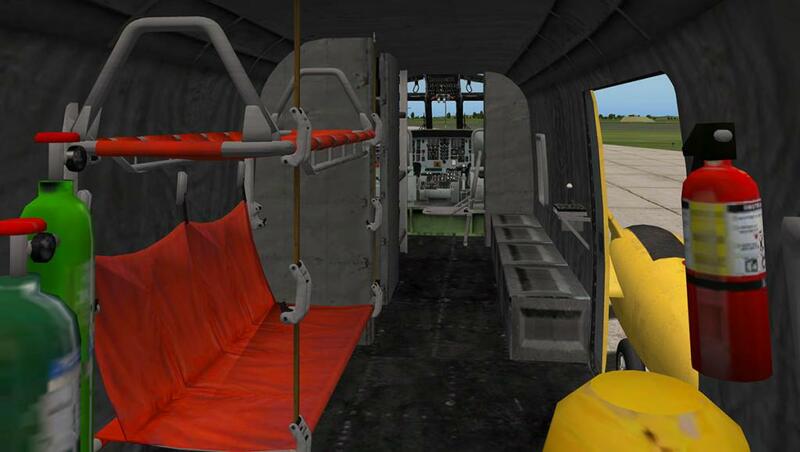 Fuselage detail is enhanced by the excellent panel work (rivets) and detailing and aerials (including wire aerials). 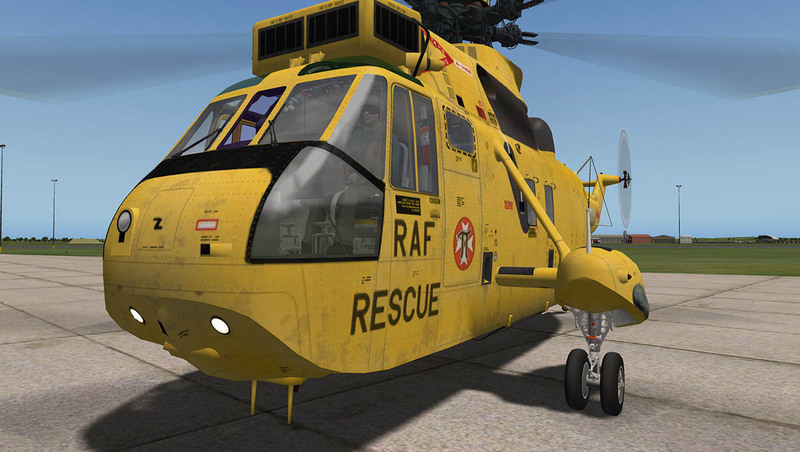 The Sea Kings wheel pontoons are expertly created with the (retractable) undercarriage, support legs and arms are perfect as are the wheels and tyres. In the variants (via the liveries) you can choose to have the huge FOD or Engine Advanced Protection System (EAPS) boxes in front of the engine intakes or not. 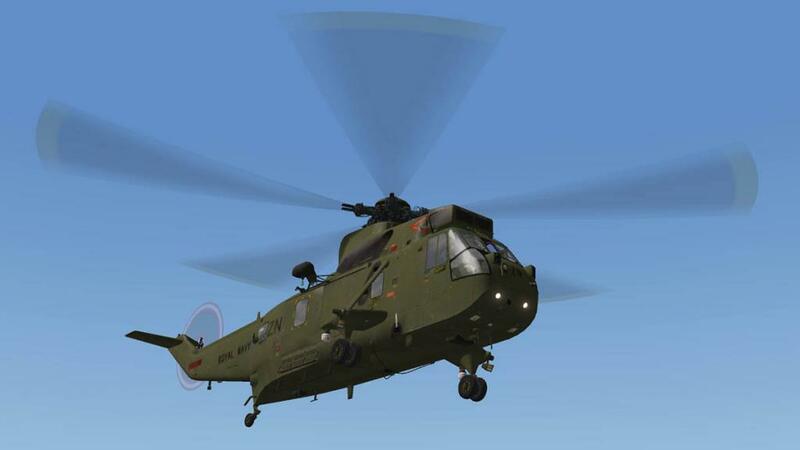 Foreign Object Damage is icing, snow, dust, salt spray, sand, debris and hot gas ingestion (HGI) that can cause problems when flying at extreme low altitudes or in the hover mode. 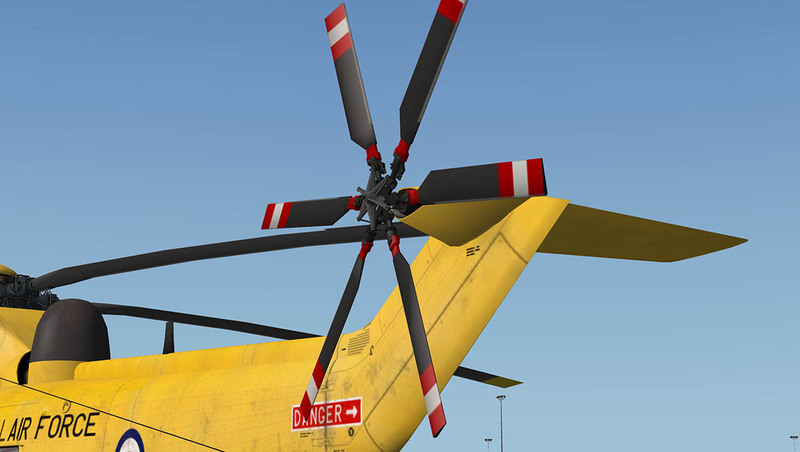 The main rotors and the tail rotors and their linkages are the heart of any helicopter design. 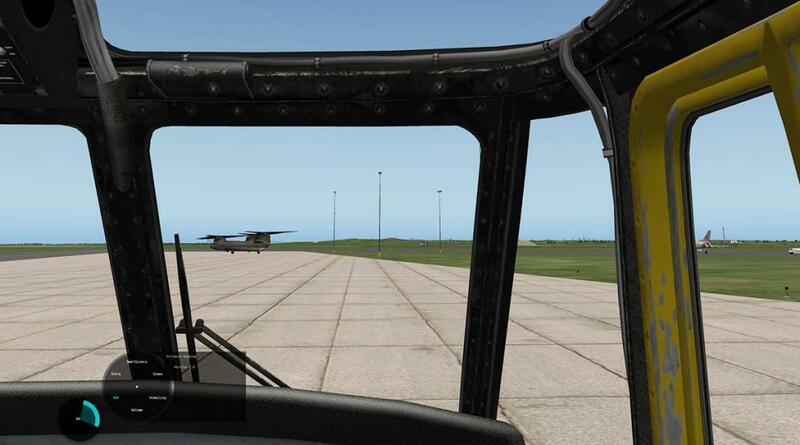 These have been totally reworked for the (finicky) X-Plane users. Get this part wrong and you can say to your credentials goodbye. Dawson Design's is however one of the best in the business. 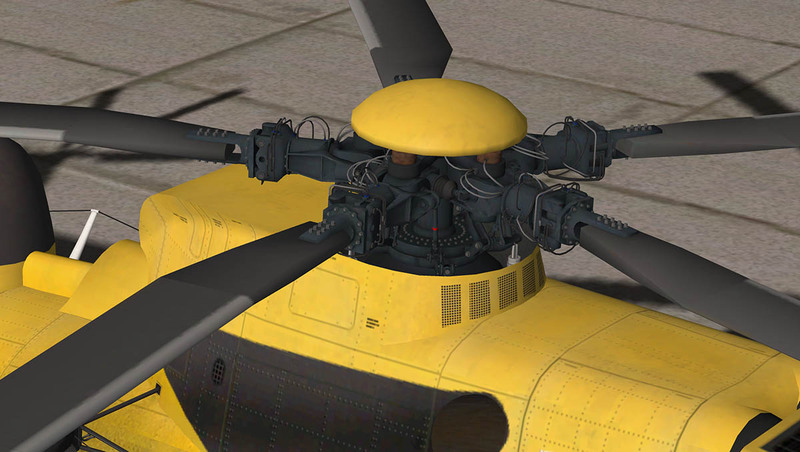 and the rotor head construction is first class craftmanship... so fully detailed, and you can move your controls to see the perfect movement of all the links and pieces. 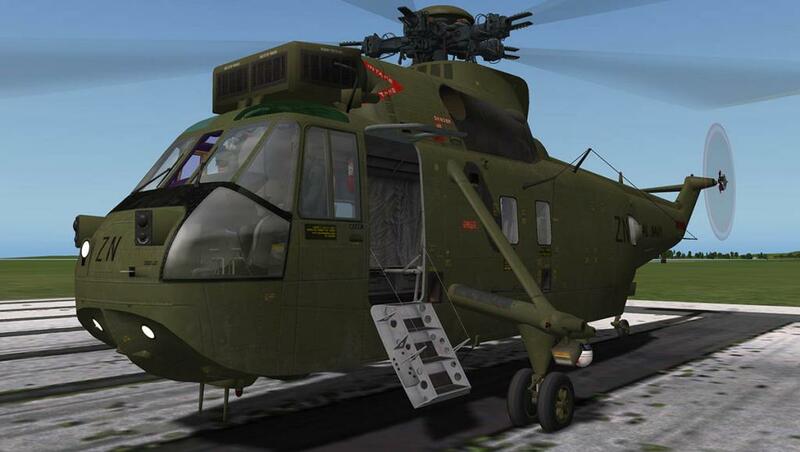 Up the built in ladder and into the cabin and the S-61has and does give you a military machine feeling. I have been in a real S-61 many times and to a point the cabin shows its 1960's heritage. They are more basic in design than you come to expect today (The UH-60 is very basic as well with exposed wiring and pop-riveted panels. No composite in sight). The panel and OHP layout is exceptional and very functional (but again quite basic). All the detailing is first rate. The seats are metal piping with canvas packs and the pedestal is built up of metal paneling. Rearwards it is mixture of SAR and ASW in the fit-out. 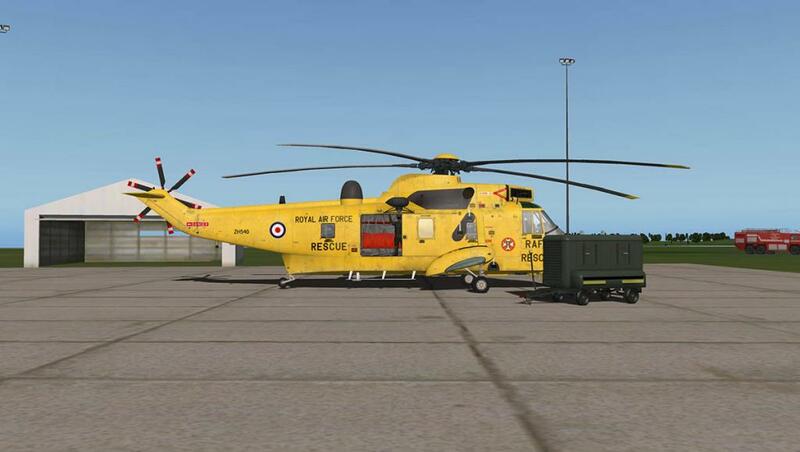 SAR in liferafts, canvas seating and a stretcher, brightly coloured oxygen and fire bottles and the ASW in a operators post (cubicle) and (boxy) equipment racks. 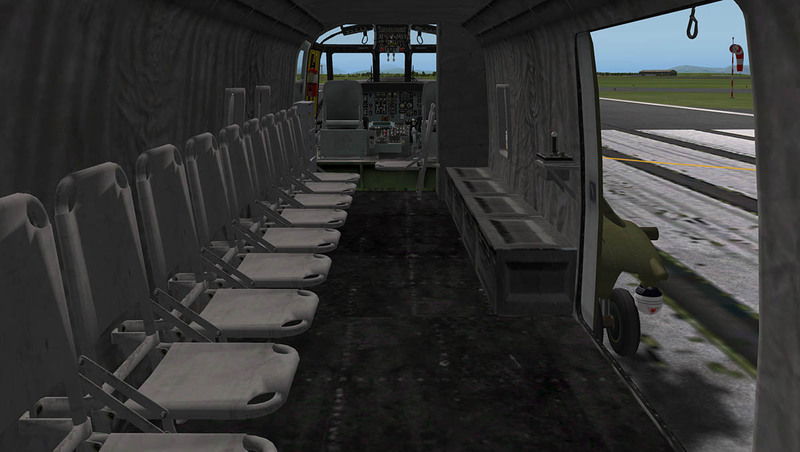 You notice the lower texture quality in the rear and if your render setting are set low, then ASW post and equipment racks and the rear cabin matted walls are a little more fuzzy than the rest of the aircraft. Set in "too Much" in the render settings then it is not to bad. but the art and detail is quite basic but still authentic. 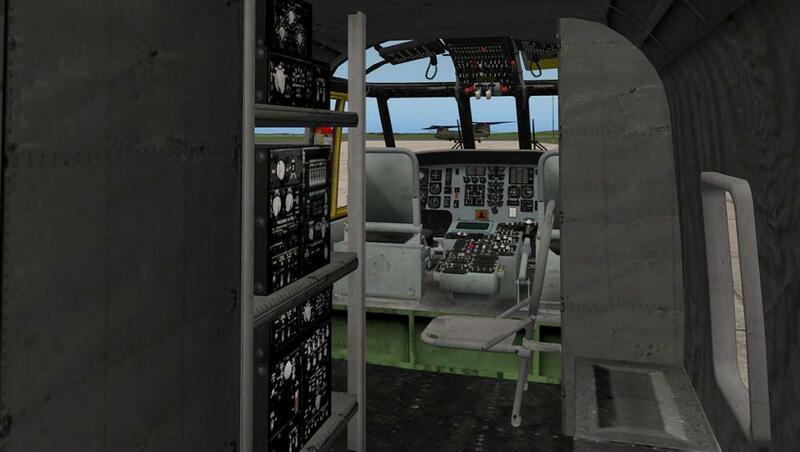 There are no problems however where it really counts, which is the main aircraft panel, OHP and the pedestal. 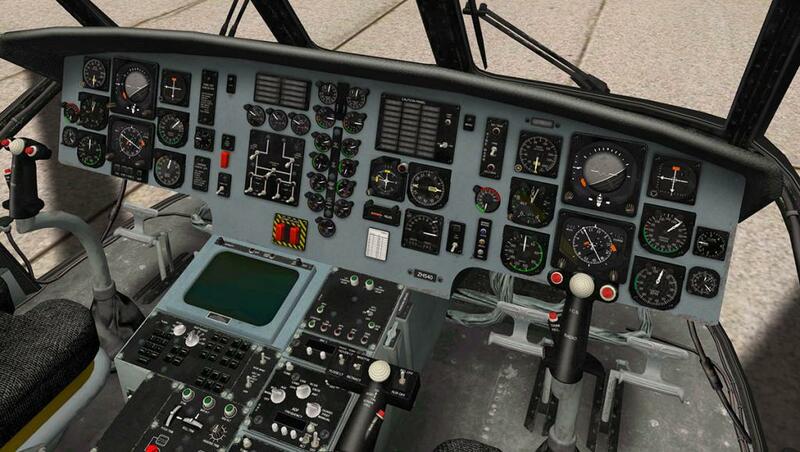 All instruments and gauges are crystal clear and highly detailed. Knobs and switch gear is perfect and only a very few are not operational. 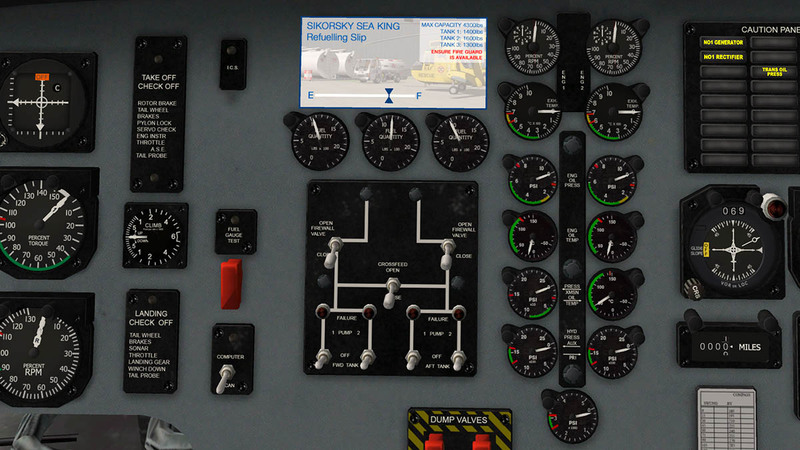 The main panel consists of the engine dials (centre), warning lights (caution panel), Nav-aids (very few), fire/DC test and the pilots instruments (Radar Altitude, Altitude, Speed, Artifical horizon, compass rose/course, RPM, climb in feet, clock and engine torque) the last dial (hover gauge) I'll come back to later. The pedestal is dominated by a huge green radar screen that has been converted to the standard Xplane map function. It is very realistic and the screen controls are set out below. Radios are very basic in VOR 1, ADF and COMMS1. 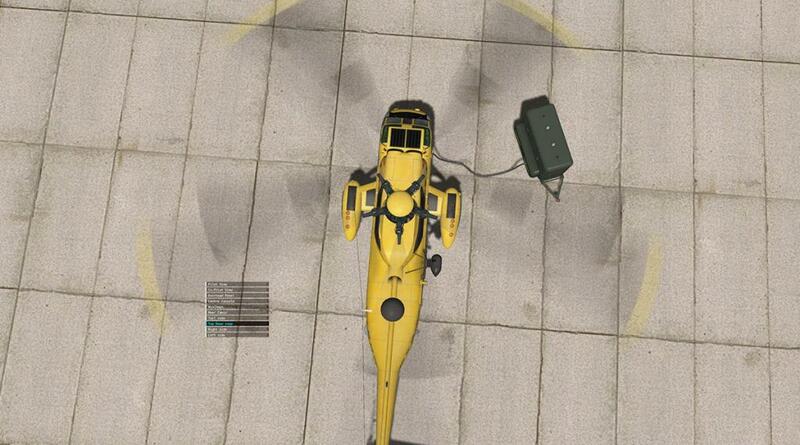 Having the VOR 1 is a bit of a non-event in a non-ILS equipped aircraft. At least with VOR 2 you can use it for navigation, and to a point you still can as you can set the higher frequencies into the radio set and you do at least get a distance to the VOR. But you would think an SAR aircraft would be better equipped. and the ADF will give a direction to a nav-aid. The other notable panel on the pedestal is the Automatic Flight Control System (AFCS) that can hover the aircraft at a set height and give you a flight pattern into and out of the "Hover mode", We will demonstrate this feature later. Centre of the main panel is the Fuel gauges that are easily set with a pop-out fuel panel. Just use the slider to quickly set the correct fuel load.... nothing can be easier. Twin sets of gauges show the engines RPM (percent), Exh (Exhaust) temp, Oil pressure (psi), Oil Temp, Transmission (gearbox) pressure/temp and Hydaulic pressure. 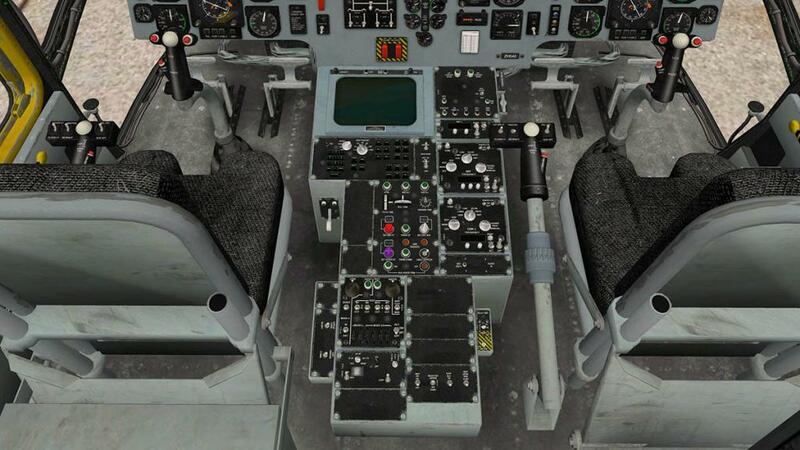 So the aircraft is not complex to use and to operate, of which would be a surprise in that you would really expect the opposite in such a large machine... Take starting the engines for example. 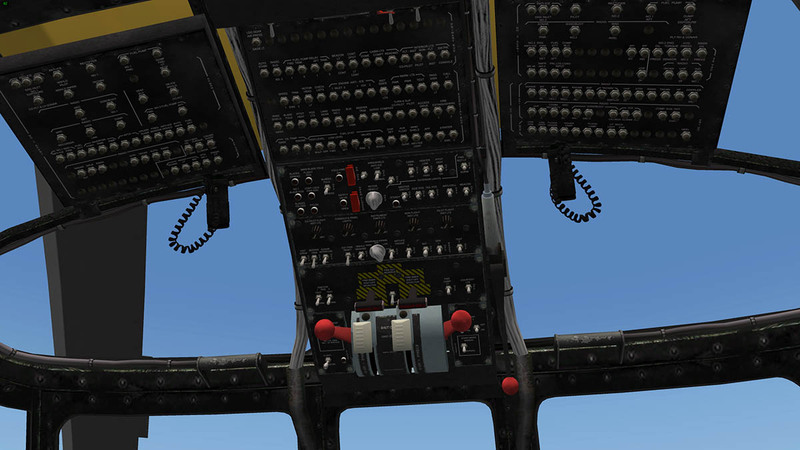 All the main engine and lighting controls are set out on the OHP (Over Head Panel). The manual is good at noting the switch gear and dials, but there is no start up instructions. Print out the checklist a that is all you really need. 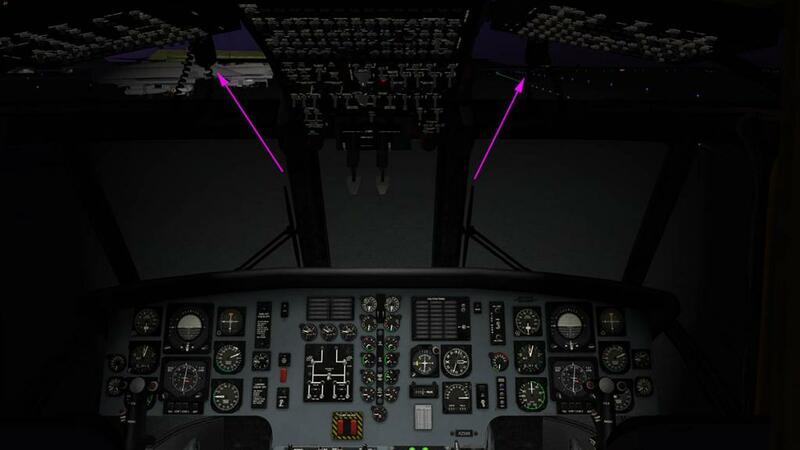 most of the checklist is testing lights and functions of the aircraft. To start you first need the EXT power (red ring centre) or the APU running (Pedestal). You can use either system. Then switch on the "Master" and then the "Battery". Nothing really works until the "Battery" switch is thrown, then you can set the panel lighting via four knobs (excellent). 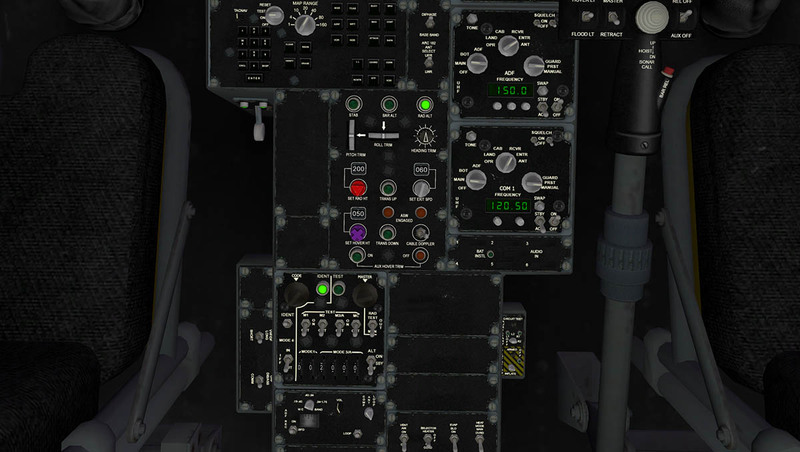 Set the two Ignition switches to on (purple circle) and the two "Firewall fuel Valve" switches (on main centre panel) to on. 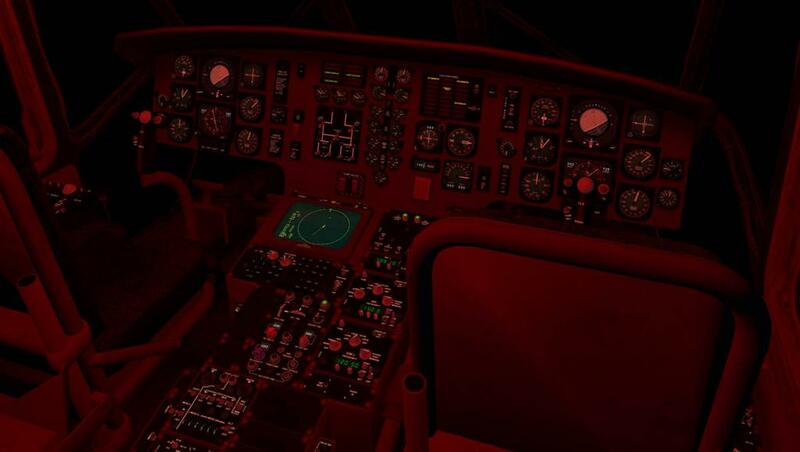 Start the beacon, anti-collision lights and the POS (nav) lights, pull off the Rotor brake (side/green arrow) and if you and the crew are all ready then start Eng 1 by pulling the main throttle/cutoff lever to GND idle (first position). With that last action the turbine above you stirs and the whine and start-up procedure gets into action mode. The dials come to life and then start Eng 2 by just pulling down the second lever to the GND idle position. 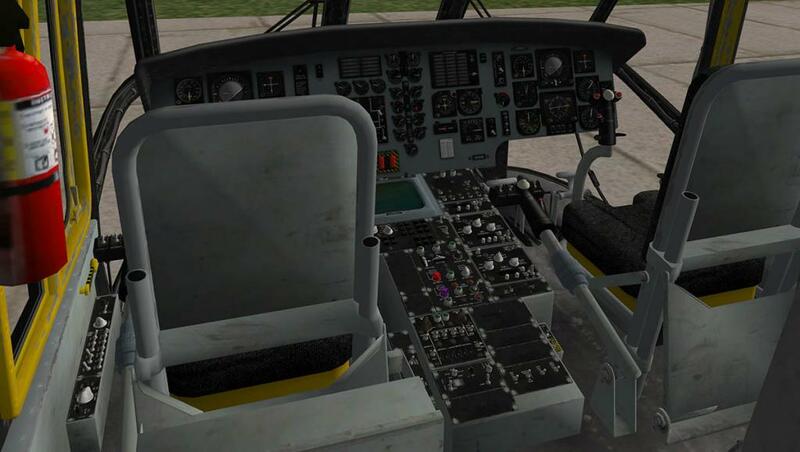 Soon the gauges will show you your torque, temps....... Click the switch to hide the GPU and switch on the generators (1&2) and your ready for flight. At this point you will need some paracetamol, The noise is deafing inside (but far quieter outside?) and we are still sitting at idle. This is a good point to use the "Menu" system. Pull both throttle levers right down to the bottom and 100% of power and wait while the engines scream louder and settle. Like starting the Sea King. Flying it is just as easy! 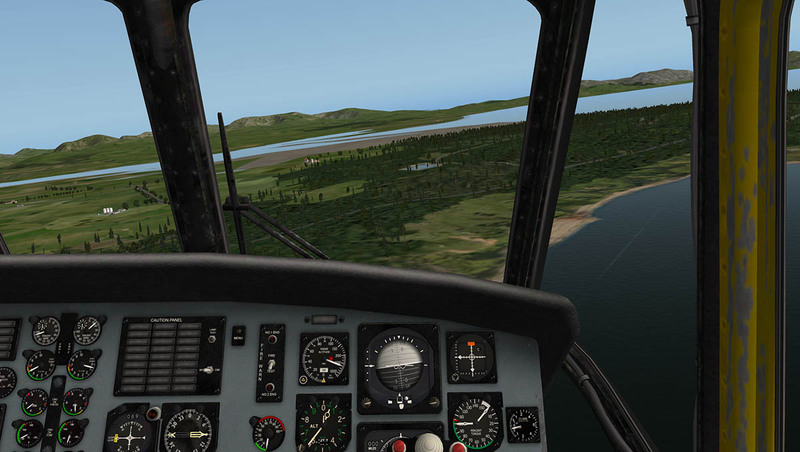 The side thrust from the rear rotor is not very strong at all and with a pull of the collective and a slight rudder correction and you are very easily airborne. 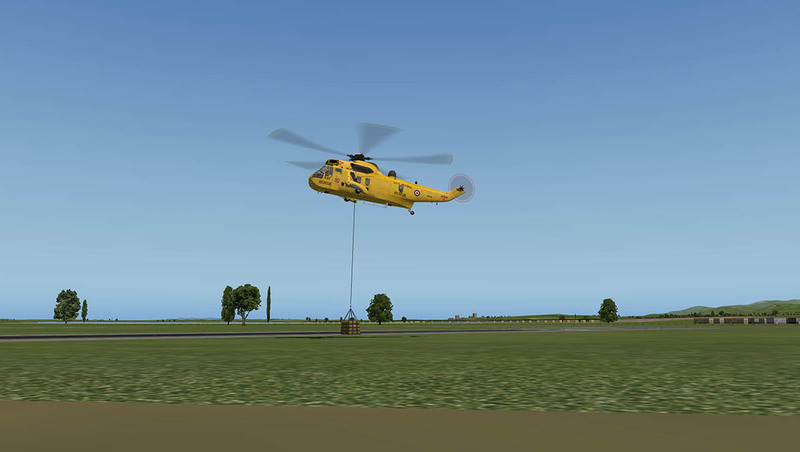 Pulling away with more collective grip the Sea King will easily move to a direct flight angle. 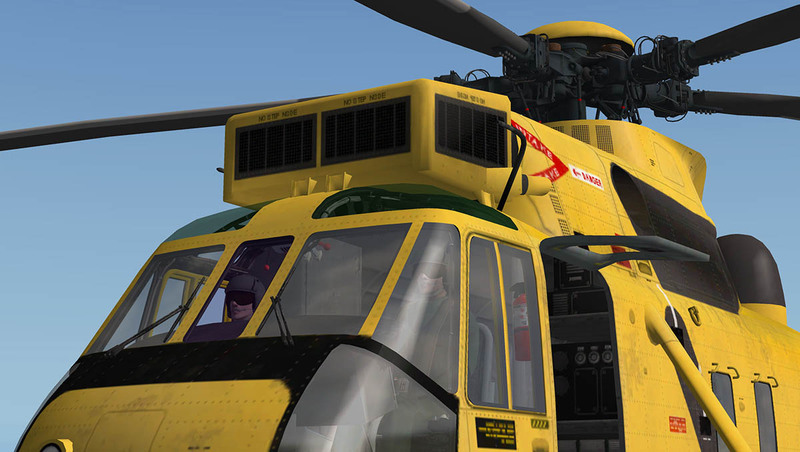 low and fast is the best way to fly helicopters and the Sea King certainly does not disappoint. 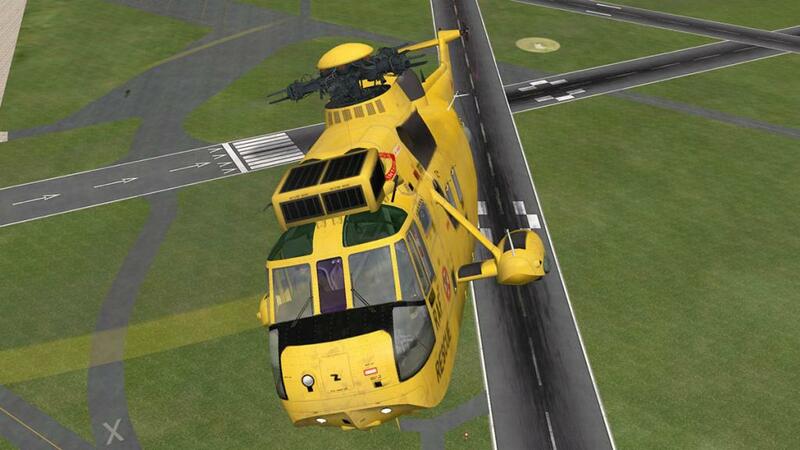 For the purists they wouldn't like the Sea King. They like nervy, edgy machines and that is nothing like the S-61. 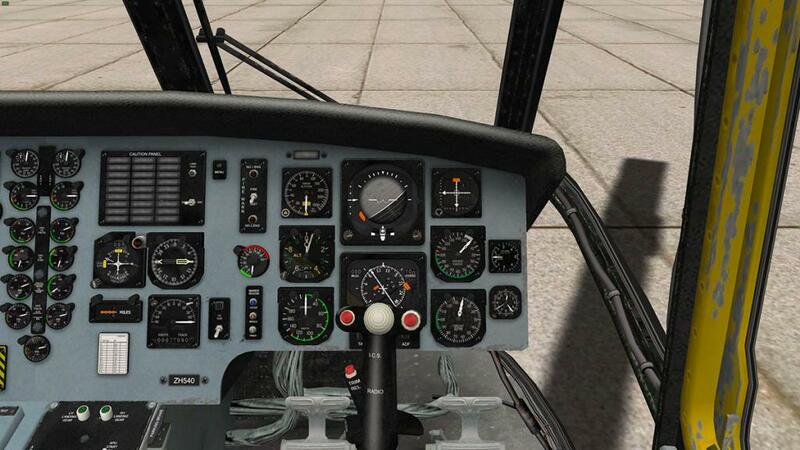 It may be its weight factor and you can in the menu adjust the feeling to a more harder flying machine. But overall it is almost too easy to fly at the 50% setting. Don't get me wrong in that for the rest of us the Sea King is an open door to helicopter flying in all its forms. Anyone can really fly this helicopter and get so much in return in flying it around the area. I still recommend a good joystick and more importantly a throttle system set in reverse on the "Collective" setting to control the machine well. My route from RAF Valley was to collect a injured person from EGCK (Caernarfon) which is only a very short ride over Anglesea. North Wales. 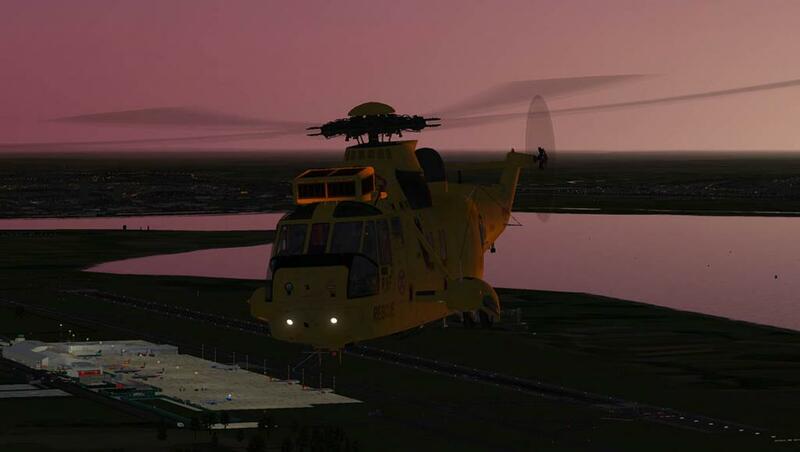 Then fly him to Liverpool Airport (EGGP) just up the coast. 2000ft is enough to enjoy the scenery without running into it. 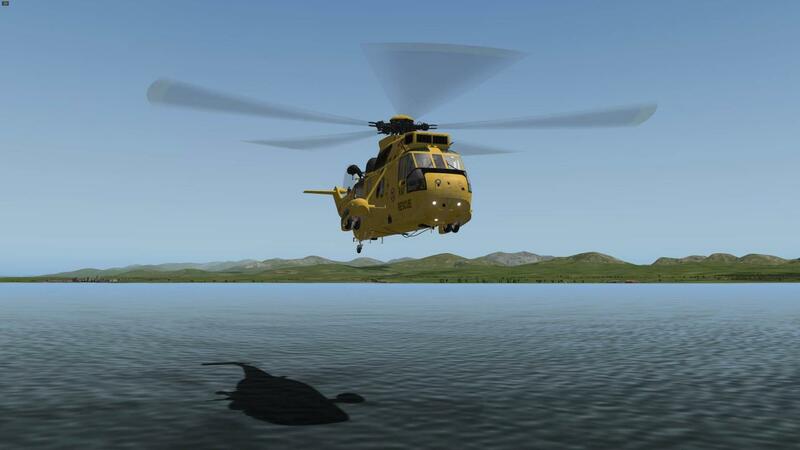 The Sea King is very quickly up to a cruise speed of 130knts and the scenery is flashing quickly under me, reducing speed and landing is an art form, the hardest is the transition from forward flight to the hover mode or vice versa (called translational lift), the hardest of all is just stopping the aircraft from going forward... rule No.1 - The brakes don't work 50ft up off the ground!.... It is an art to get the process right. But the Sea King is very kind to you in all these areas. It will easily run off speed with a lift of the nose, and an easy balance between the collective and the cyclic (the stick between your legs) will easily help you put the aircraft down right (in my case in the centre of the runway) of were you want to land. 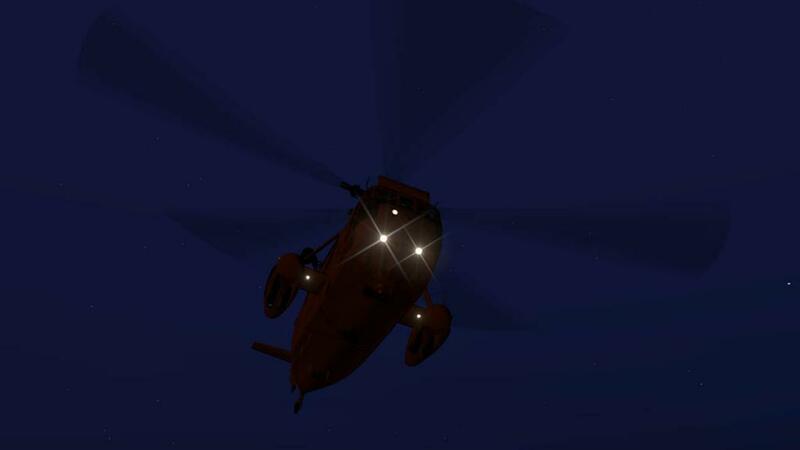 The rules of flying helicopters still applies, so if you are totally inept then you will still crash. But the Sea King is far kinder than most I have flown. As a learning tool it is exceptionally very good. But most of all it is good just to fly without all the sweat and tears that can accommodate most flying in this genre. It is just good genuine fun of an aircraft to fly. Leaving EGCK I head north to EGGP, 2000ft is again my choice, It is very noisy and after a while even tiring over a distance. 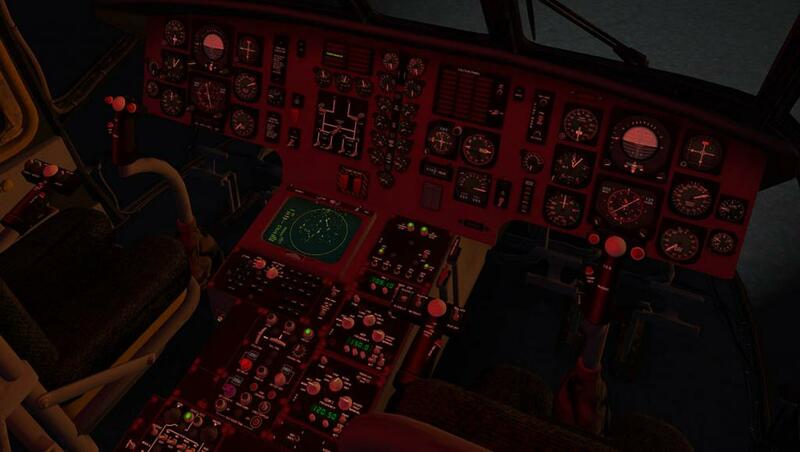 There are no pilot-aids, Your only aid is to find a comfortable grip on the cyclic/joystick and try to keep the aircraft as smooth as possible, and that is far harder than it looks. For ten minutes or so you are fine and then you are then slowly drifting up or down as your arm or wrist tires. 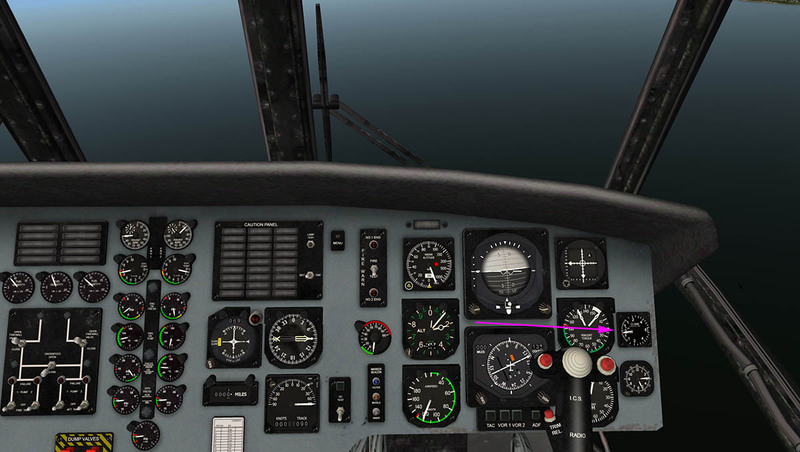 You become obsessed with the rate of "Climb/Descend" (arrowed) instrument to keep the aircraft level. it is easy to do, but you keep tiring yourself out over a period of time. 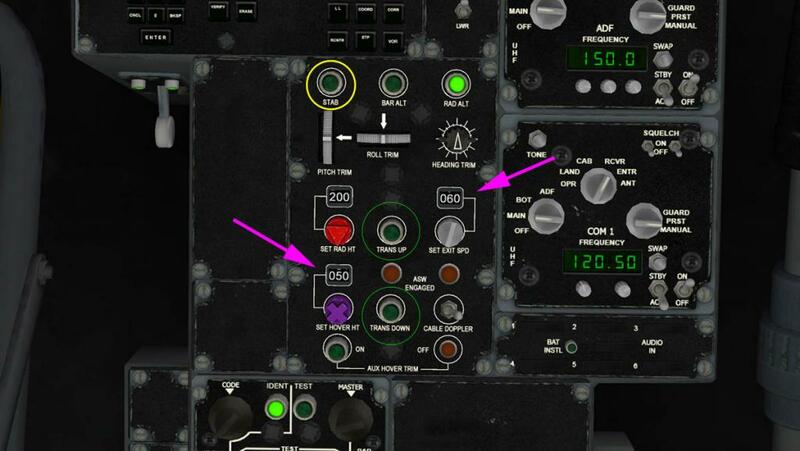 There are Pitch/Roll/Yaw Stability switches on the pilots side panel that helps. 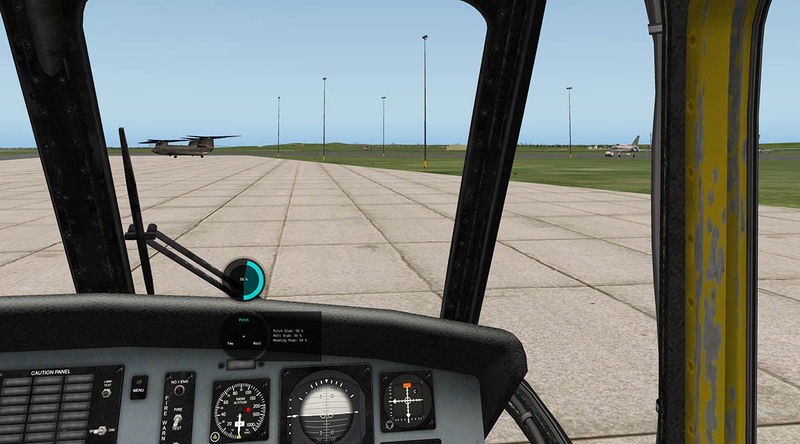 Landing was a breeze of coming into the hover and a slight move to the right to land on a blocked off taxiway. Departure back to RAF Valley was just before dawn the next morning, You have a main cabin light on the rear bulkhead to bathe the cabin with a bright light, that is perfect solution for setting the aircraft up in the early light. 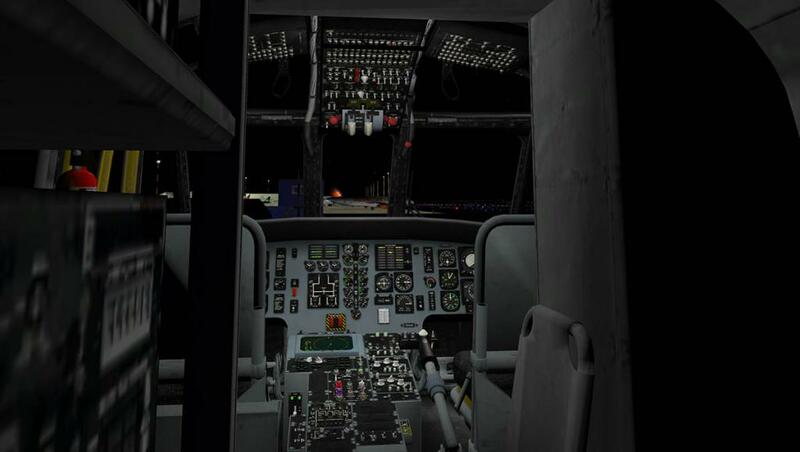 In the dark the instruments show the great lighting and detail of the pedestal and the switches by the pilots right armrest have the cargo switch, audio switches and stability switches. The external lighting is very flexible. Standard Nav (pos) lights,Beacon and Anti-collision on the tail and under the hull. 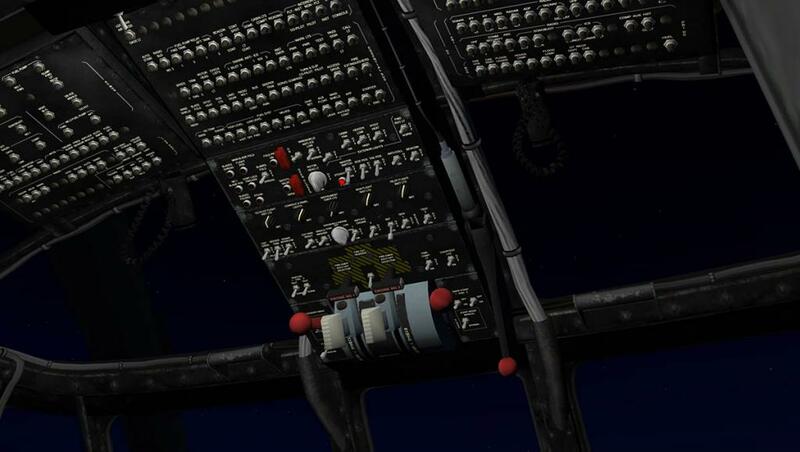 On the collective are two switches for three lighting functions 1) "Master-On /Retract-Off" will give you two main landing beams. 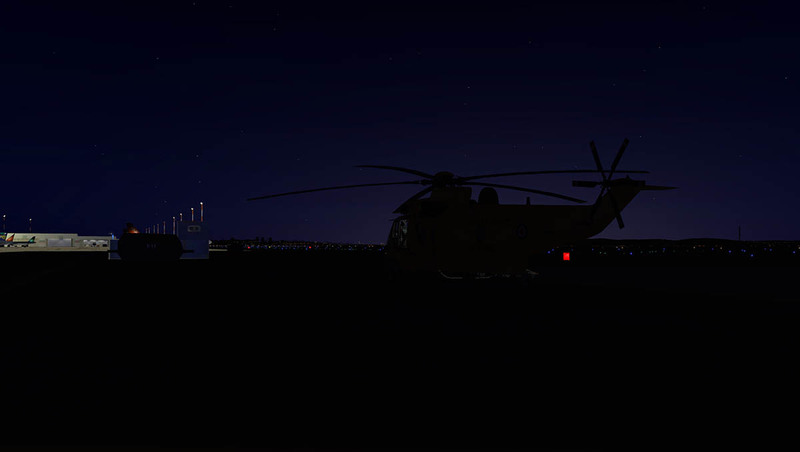 2) "Hover LT" will give you a single large light aimed downwards, "Flood LT" gives you a barrage of downward lights (one under the aircraft, one on each pontoon (2) with a third in the rear of the right pontoon. The Pos and Beacon lights are average with just really the colour of the light. In the daylight they can't really be seen at all. Departure was in the first light and you were soon cruising along at 140knts and again at 2000ft. first again I followed the coast south and then cut straight across Anglesea. It was a long way back - but you were guided by the line of the beacons of EGOQ (Mona) and behind RAF Valley. I was not going to be on the ground very long. There was another job on the board and it was to deliver a cargo pallet to Caernarfon Airport (EGCK). 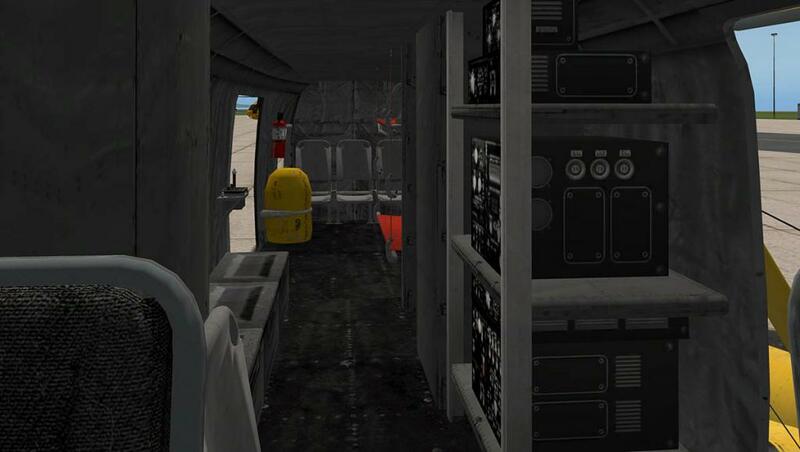 You can attach a cargo pallet to the hook under the aircraft (switch is on the Pilots side panel). 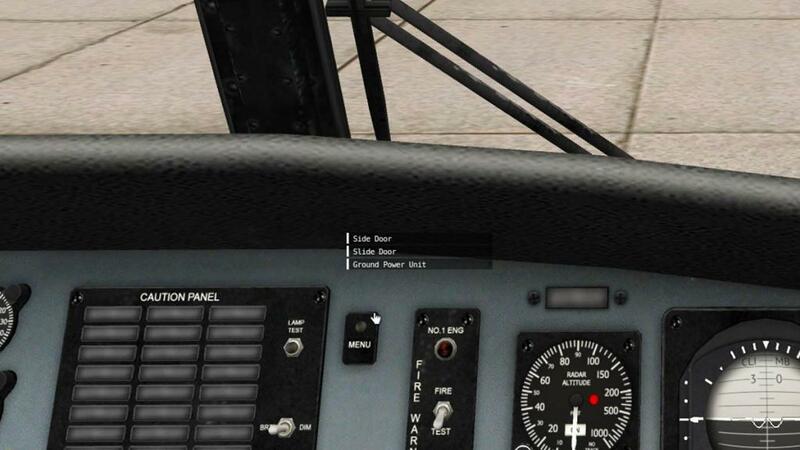 First go to the "Weight, Balance & Fuel" menu (aircraft) and you will see a new menu section. 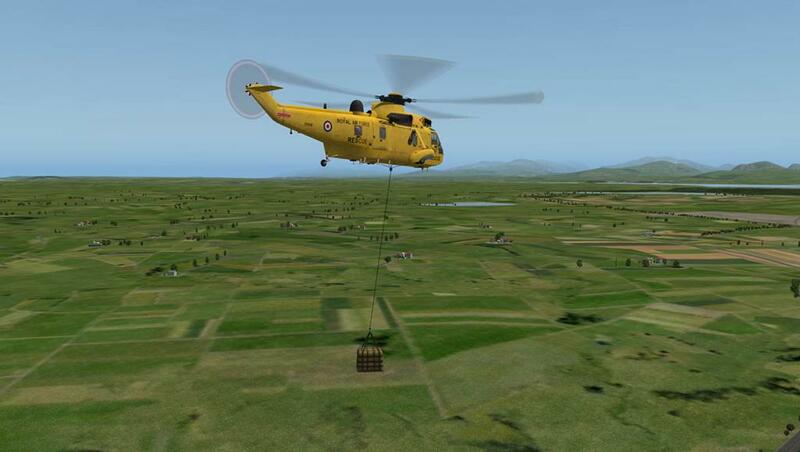 Here you can load a "cargo.obj" that is located in the main Sea King folder files under "Cargo Crate"... load the object and set the weight you want with the slider. "Slung load size is the length of the cable? but I am not sure about that. 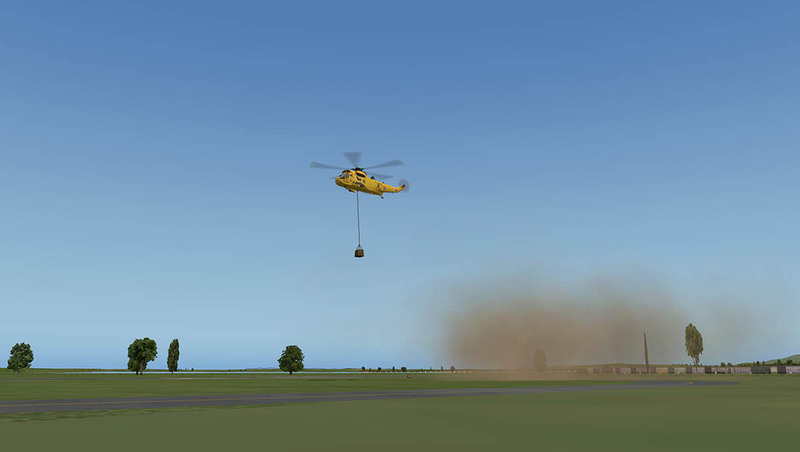 With the slung load gone we can see how the Automatic Flight Control System (AFCS) works. 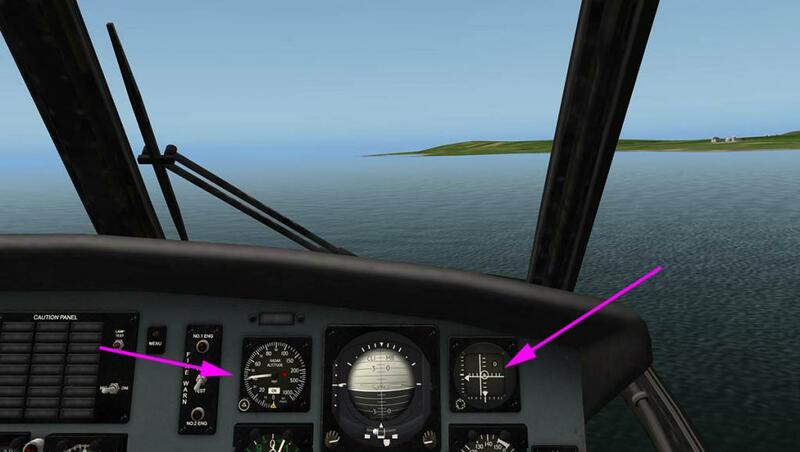 The idea is to help you hover the aircraft in an automatic mode. It also allows the winchman in the rear to take control of the aircraft to position it in various directions to use the hoist. The system is located on the rear of the pedestal. 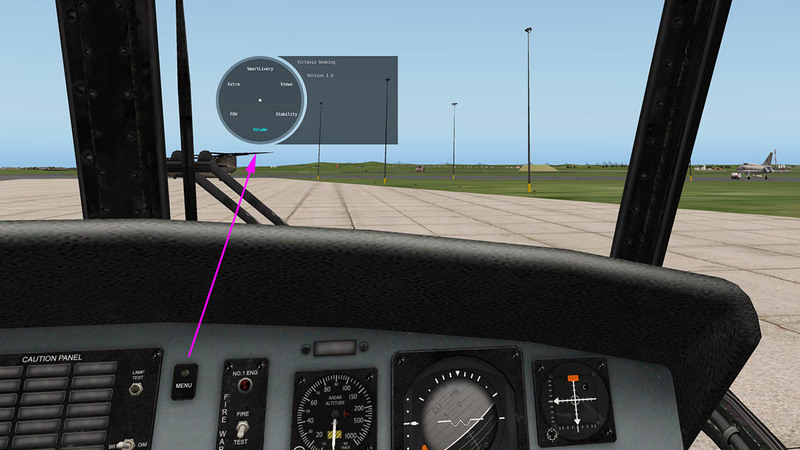 You can set the hover height (50ft) and the "Exit" speed (60knts). 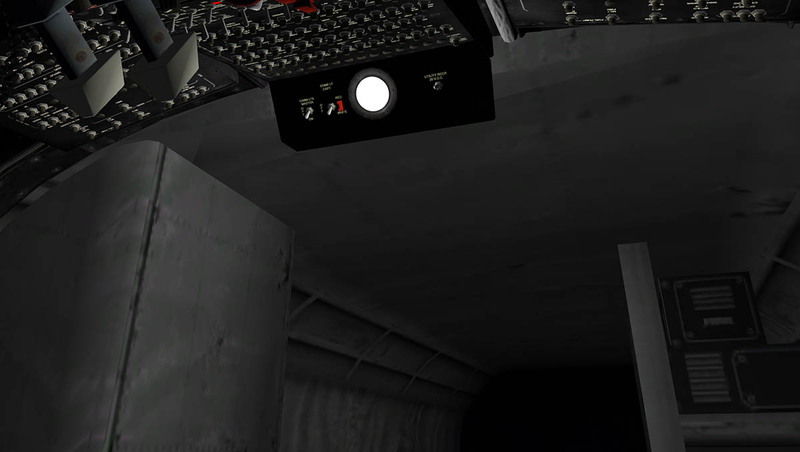 The "STAB" button activates the system. TRANS Down will take control of the aircraft and transition you down to the 50ft setting were it will hover there for you. 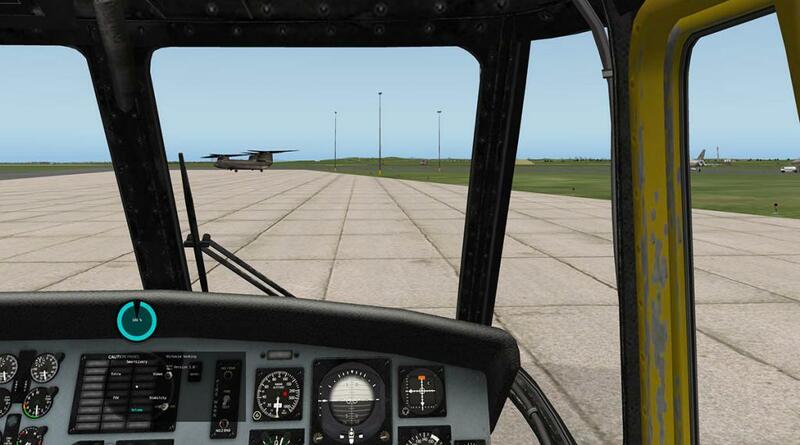 It take a little getting use to and the aircraft shakes out of your control as it does the transition. 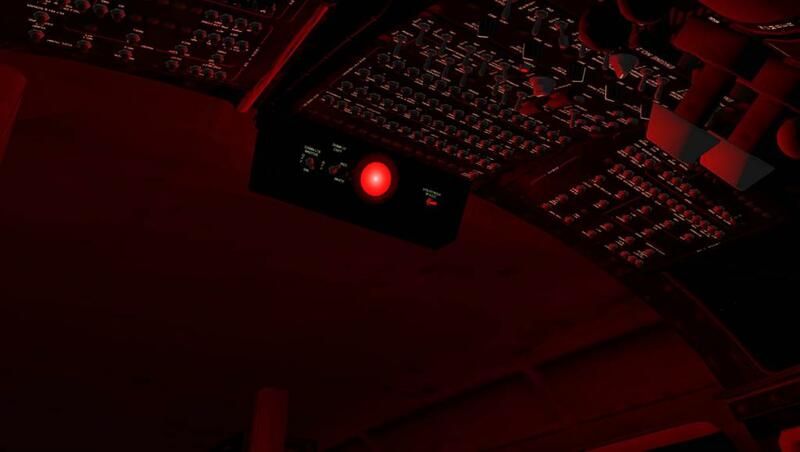 You can help the system by positioning the aircraft where you want it and then pressing the button. If you want to go lower or higher then just change the height setting and you will go down or up very slowly (great fun). 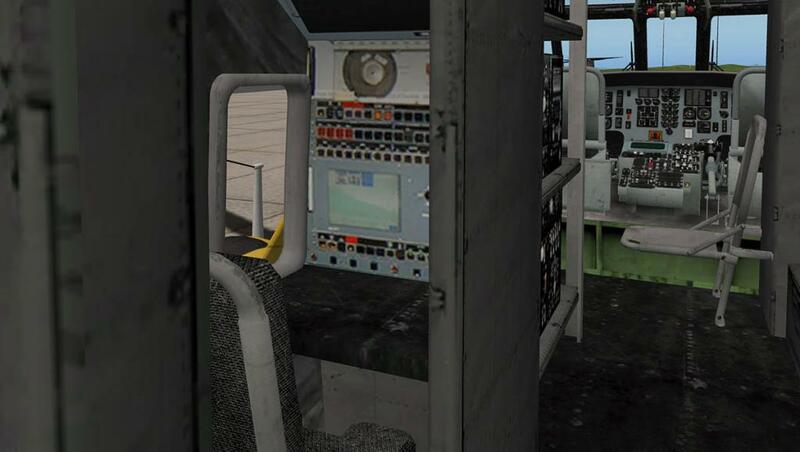 In the rear by the door (use the views in the menu to get there quickly) is a control joystick which is activated by the "Aux Hover Trim", and you can move it in four directions to position the aircraft. 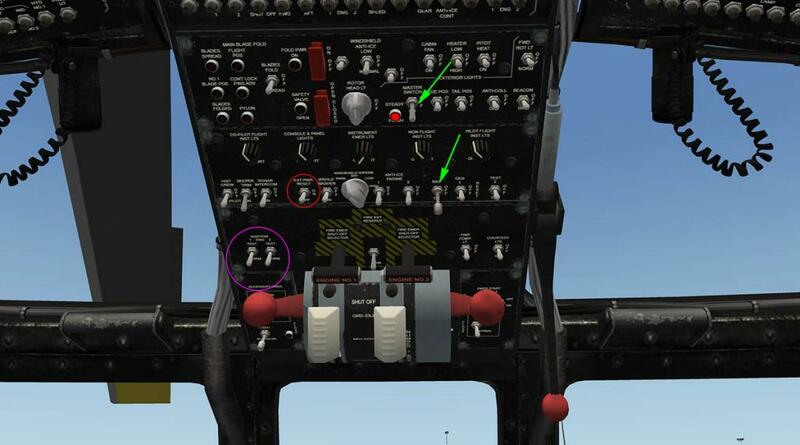 You can also switch the system back to the cockpit (Aux Hover Trim Off) so the pilot can regain control. 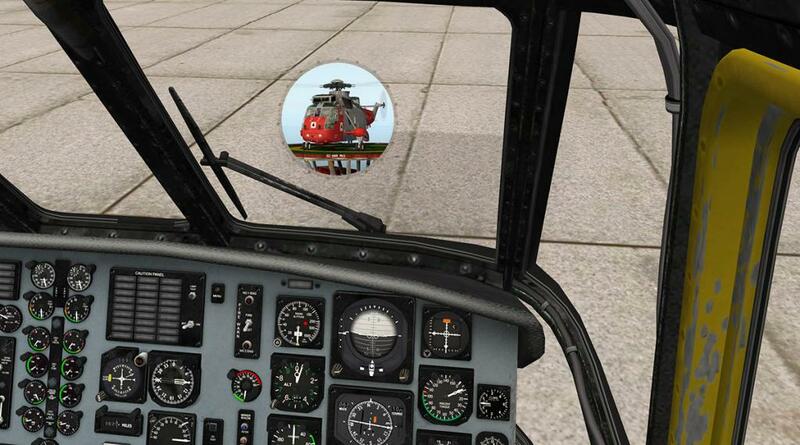 Pressing TRANS Up will make the machine transition up to the "Exit" set speed 60knts) out of the hover mode. 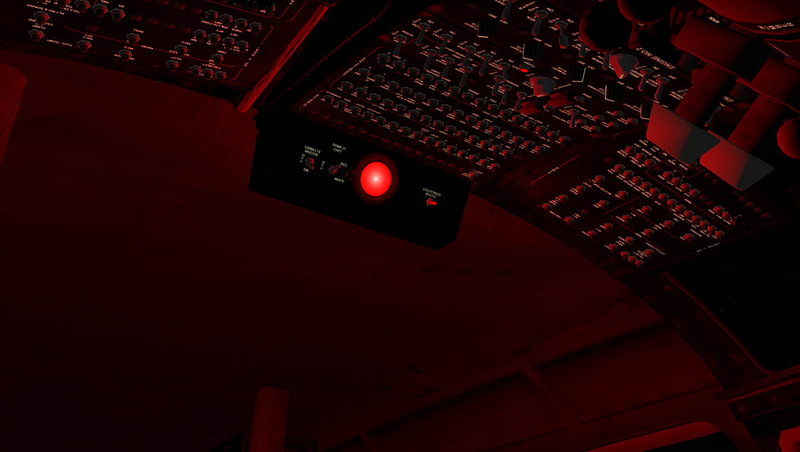 to get control back for the pilot then just press the "STAB" button again. But a bit of a warning on repressing the "STAB" button again. It comes out of the system with a thunk, and it takes a bit of practise to get a smooth line of control back with the collective and the cyclic. 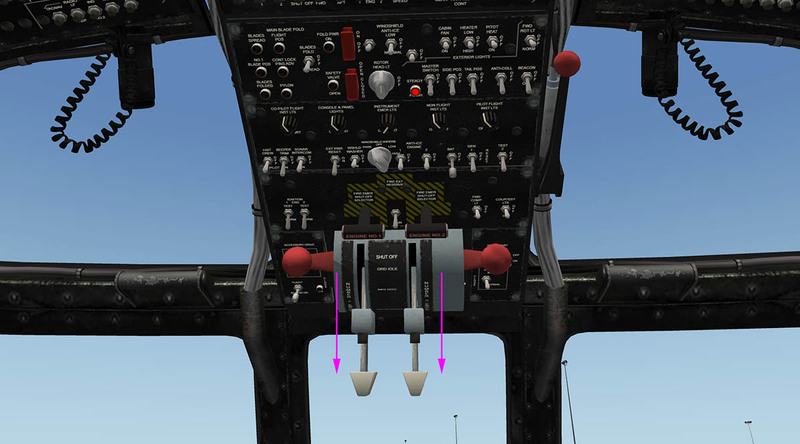 Another tool you can use to control the hover is the "Hover" Gauge. This is a cross-hair tool to create and keep a standing hover. and it has 3 modes (A,C and D) A mode monitors the ASE coupler and displays the milliampere input to the pitch, roll, yaw and altitude (but doesn't work here), C mode is off. 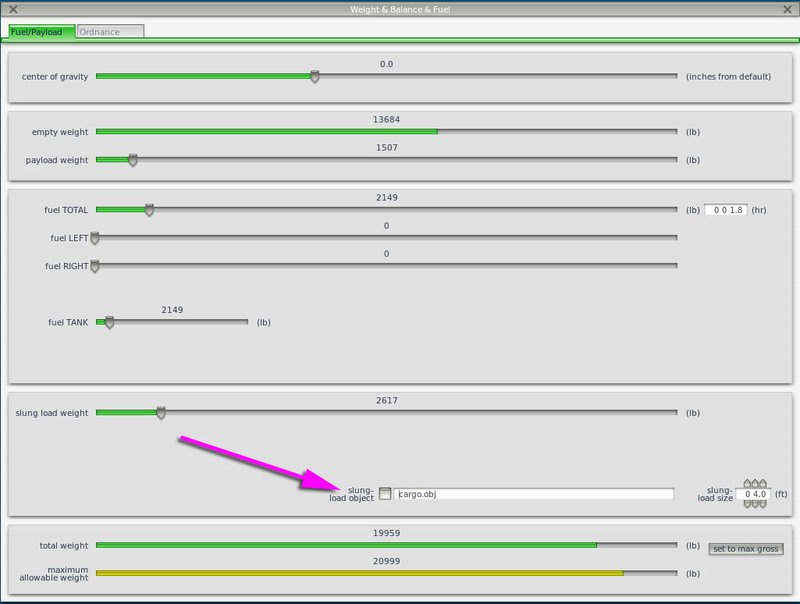 D mode connects the hover indicator to the Doppler and you can use the horizontal and vertical bars to align your hover speed to zero. It is best used with the Radar Altimeter (left). But be careful as you align your hover as at that point you also lose lift. More collective for lift will then move the aircraft off your perfect cross-hair... practise makes perfect and you soon learn how to hover easily. The hover gauge is then a great tool to learn how to do this, and those skills can then be translated to other types of machines. 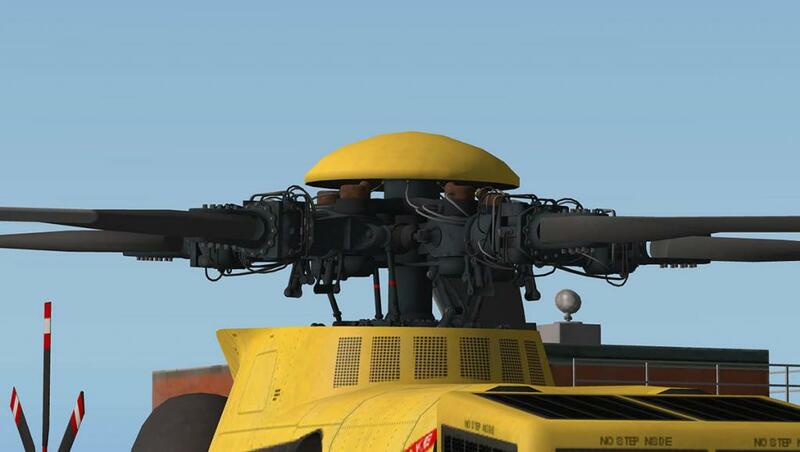 You have so many (to note) different attachments which include different radar domes and retracted refueling probes. The famous "Marine One" livery is missing from the package (In fact sadly there is no passenger civil version S-61L/N or Coast Guard either) but there is a (rough) Marine One version by PetJedi on the .org. 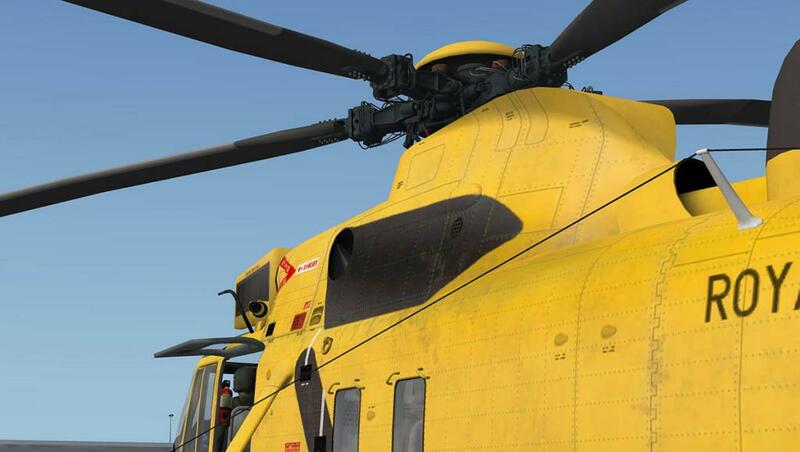 To sum up the Virtavia and Dawson Design Sea King in one word is easy, as it is "Accessible". The accessibility to easily get through the startup from cold to flight is not going to keep you in bed for hours reading manuals, a quick run through the checklist and your ready for flight. That is not to say the Sea King is not authentic because it is, and very good it is too. 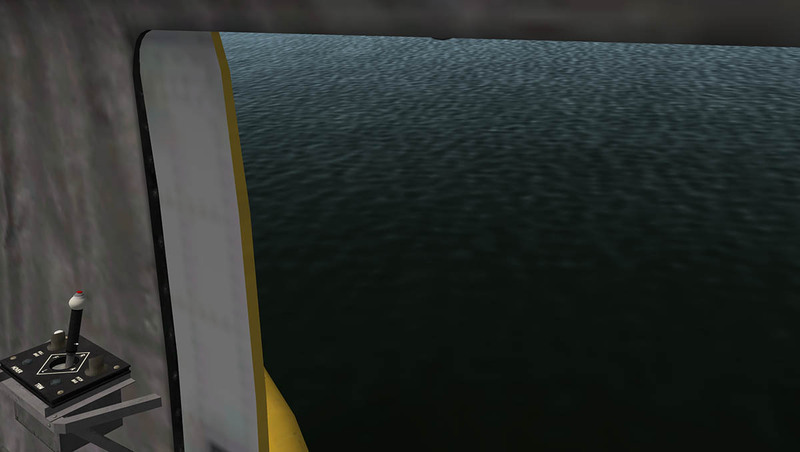 But the aircraft itself is not very deep. Secondly from the moment you first take off you realise that this aircraft is going to give you a lot excellent flying without all the worry of mastering a delicate helicopters (nervy) control needs. 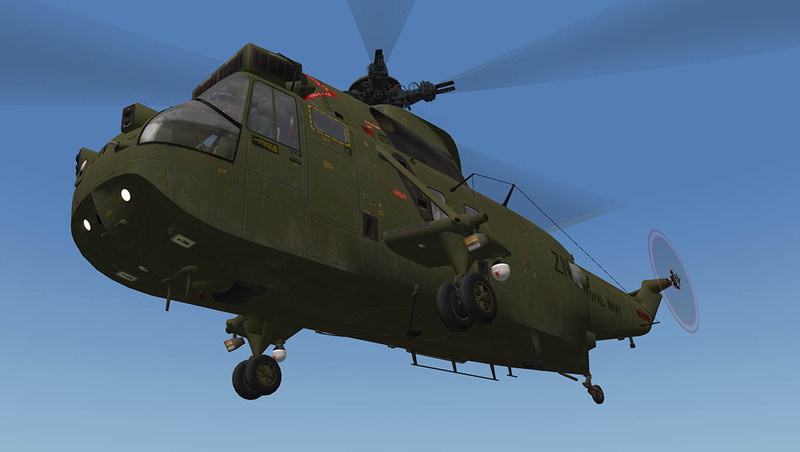 All helicopters are still basically unbalanced, but here you can at least enjoy the machines with out to much of the heartbreak that goes with them. 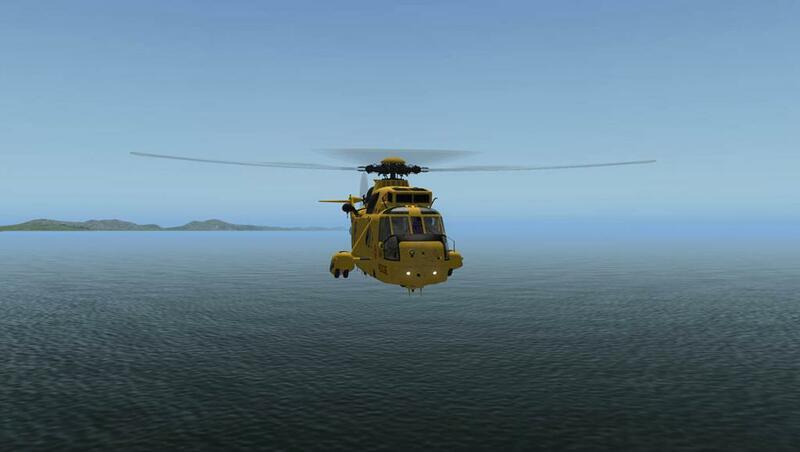 In fact the Sea King is down right enjoyable to manoeuvre and fly (except for over very long distances with tiring wrist wearyness with no pilot aids). 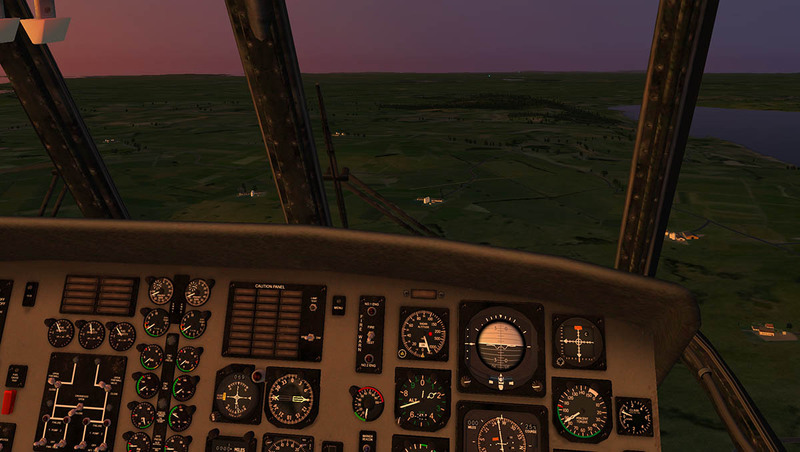 The combination of Virtavia's FSX/P3D design and quality and the extensive reworking and added features for Xplane is a total win-win situation for us, and the aircraft is very good and that huge selection of liveries are excellent in design and quality. 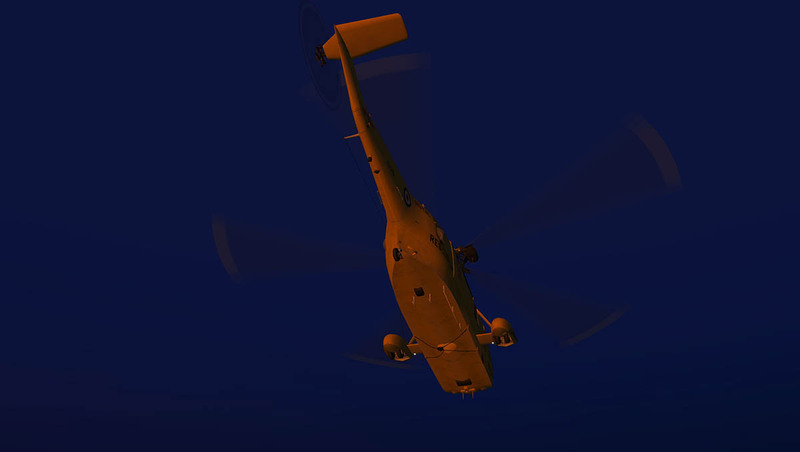 (on small thing to note is if you have an Xplane shutdown issue it is the Dreamworks sound engine, so update to the new version 0220 to rectify that (don't forget to install the plugin in both aircraft versions). 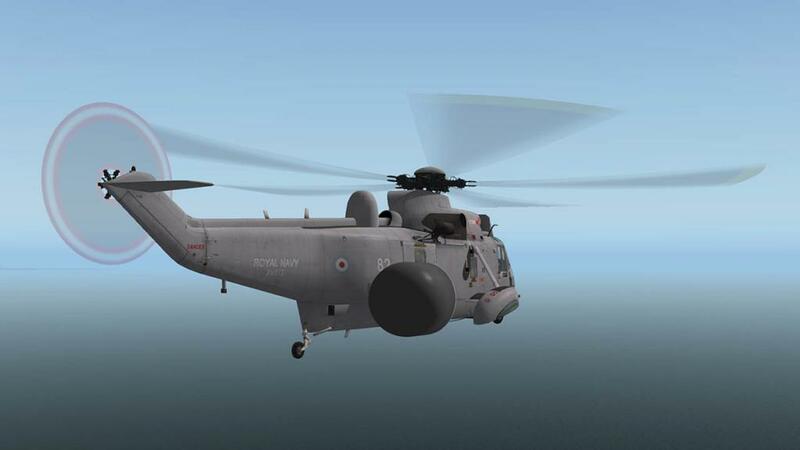 Sounds are excellent with blade slapping, torque noise and 3D positioning but I did find the external doppler effect good and then to drop away a little too quiet as you move around the aircraft, inside it is just plainly noisy and hair tingling good. There is the feature of the Ge-Force plugin simulates the characteristics of human head behaviour as your brain instinctively usually stabilises your head (eye) movements. 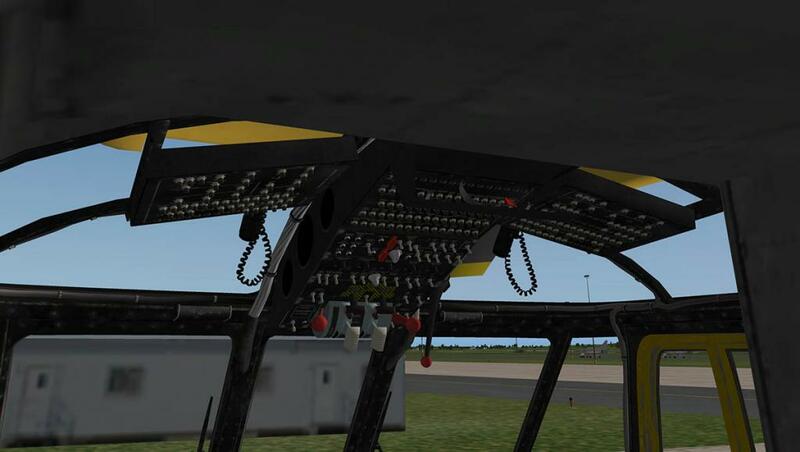 here the plugin flattens that feeling out and gives you a natural feeling of flying the aircraft. 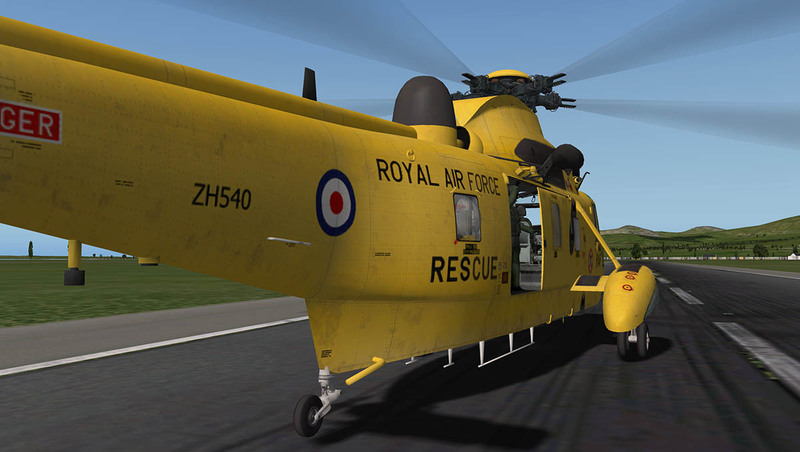 Channel your inner English Royal family and join in their careers moments with the Sea King, Prince Andrew flew Sea Kings in the Falklands War and the current third in line Prince William flew Sea Kings out of RAF Valley on SAR missions (both were very good too). No real faults except with the slightly average textures in the rear, but a few wishes. Rain effects would be great feature on the Sea King as you try to find that ship or oil rig in a storm, A passenger version would be also great for island hopping, and a Coast Guard version for those who love to guard coasts. 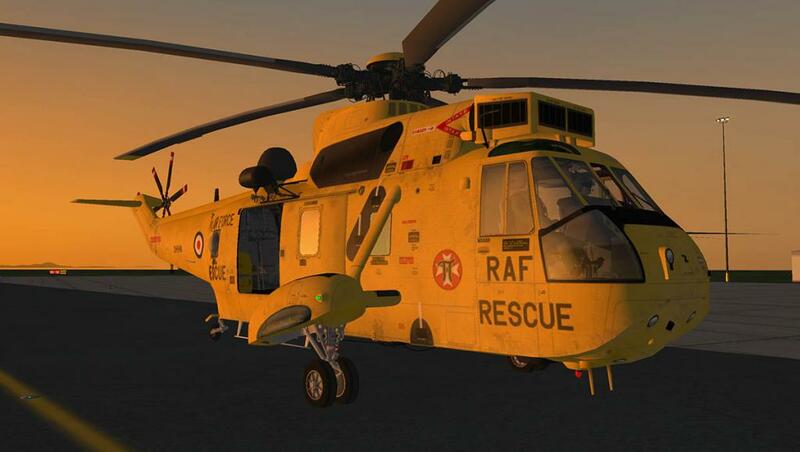 In real life the Sea King was a formidable aircraft, and its final service life was very long. 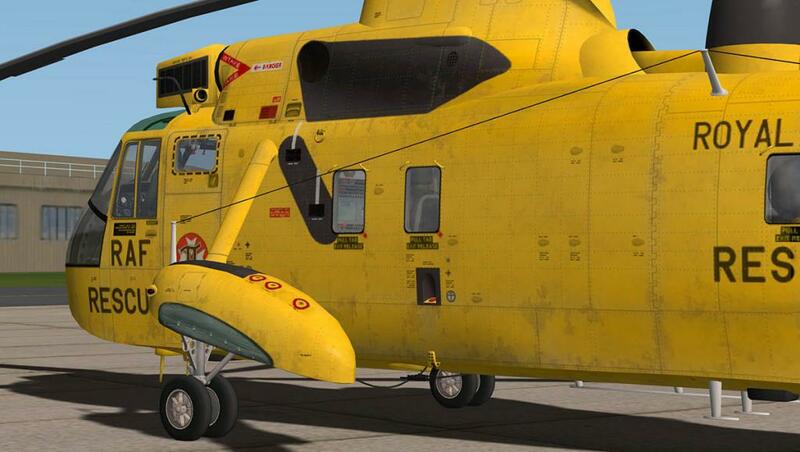 For us we can with this V/DD aircraft find out why and enjoy this aircraft for its shear versatility and features. Every simmer dreams about flying certain aircraft. 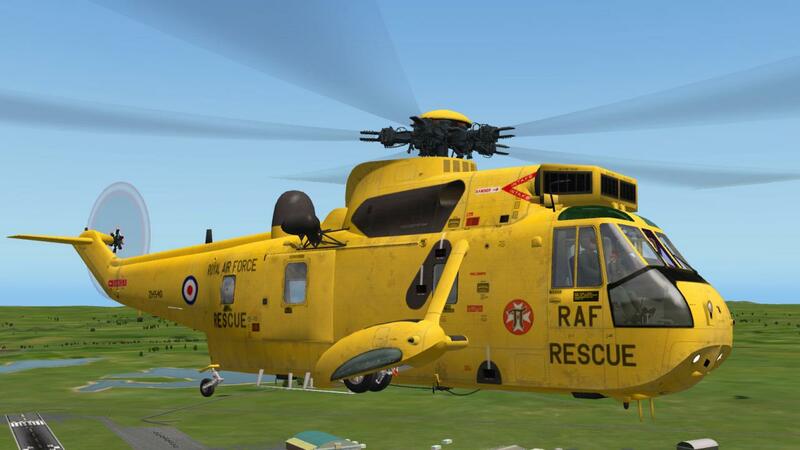 And to fly the Sea King was a childhood dream come to life. The most important thing is the Virtavia and Dawson Design Sea King didn't ruin a great aircraft but enhanced it beyond measure, Could that slip in a little bias in a review?. not in this case as it is so very good and a great investment in pleasure and flying... 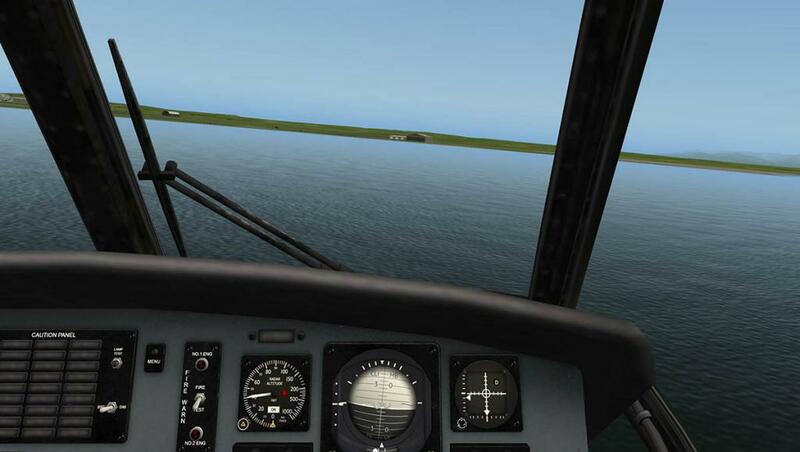 It is also excellent place to start to learn to fly rotary aircraft because of its stability and hover tools. 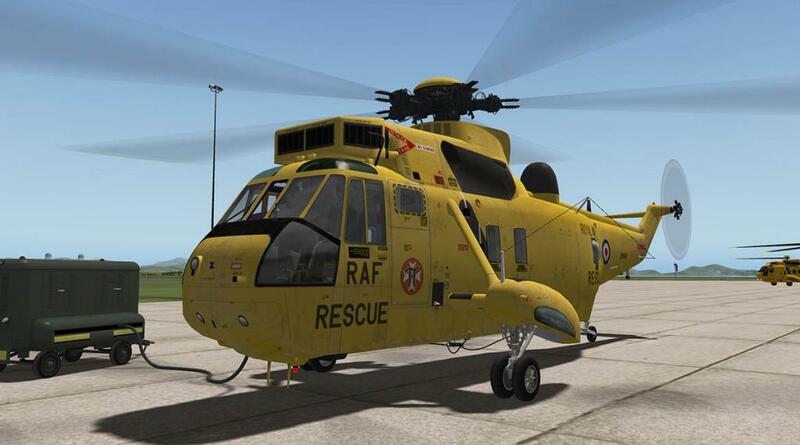 Overall the Sea King SH3 an excellent aircraft. I fly in VR through FlyInside with Oculus Rift and LeapMotion sensor, so having fully interactive cockpit is also important. I'm hoping the developer will update the model.